Revised records of atmospheric trace gases CO2, CH4, N2O, and δ13C-CO2 over the last 2000 years from Law Dome, Antarctica Revised records of CO2, CH4, N2O, and δ13C-CO2 from Law Dome, Antarctica Mauro Rubino et al. Ice core records of the major atmospheric greenhouse gases (CO2, CH4, N2O) and their isotopologues covering recent centuries provide evidence of biogeochemical variations during the Late Holocene and pre-industrial periods and over the transition to the industrial period. These records come from a number of ice core and firn air sites and have been measured in several laboratories around the world and show common features but also unresolved differences. Here we present revised records, including new measurements, performed at the CSIRO Ice Core Extraction LABoratory (ICELAB) on air samples from ice obtained at the high-accumulation site of Law Dome (East Antarctica). We are motivated by the increasing use of the records by the scientific community and by recent data-handling developments at CSIRO ICELAB. A number of cores and firn air samples have been collected at Law Dome to provide high-resolution records overlapping recent, direct atmospheric observations. The records have been updated through a dynamic link to the calibration scales used in the Global Atmospheric Sampling LABoratory (GASLAB) at CSIRO, which are periodically revised with information from the latest calibration experiments. The gas-age scales have been revised based on new ice-age scales and the information derived from a new version of the CSIRO firn diffusion model. Additionally, the records have been revised with new, rule-based selection criteria and updated corrections for biases associated with the extraction procedure and the effects of gravity and diffusion in the firn. All measurements carried out in ICELAB–GASLAB over the last 25 years are now managed through a database (the ICElab dataBASE or ICEBASE), which provides consistent data management, automatic corrections and selection of measurements, and a web-based user interface for data extraction. We present the new records, discuss their strengths and limitations, and summarise their main features. The records reveal changes in the carbon cycle and atmospheric chemistry over the last 2 millennia, including the major changes of the anthropogenic era and the smaller, mainly natural variations beforehand. They provide the historical data to calibrate and test the next inter-comparison of models used to predict future climate change (Coupled Model Inter-comparison Project – phase 6, CMIP6). The datasets described in this paper, including spline fits, are available at https://doi.org/10.25919/5bfe29ff807fb (Rubino et al., 2019). Rubino, M., Etheridge, D. M., Thornton, D. P., Howden, R., Allison, C. E., Francey, R. J., Langenfelds, R. L., Steele, L. P., Trudinger, C. M., Spencer, D. A., Curran, M. A. J., van Ommen, T. D., and Smith, A. M.: Revised records of atmospheric trace gases CO2, CH4, N2O, and δ13C-CO2 over the last 2000 years from Law Dome, Antarctica, Earth Syst. Sci. Data, 11, 473-492, https://doi.org/10.5194/essd-11-473-2019, 2019. The three well-mixed (long-lived) atmospheric greenhouse gases (GHGs) that contribute the most to current global warming are CO2, CH4, and N2O. Their concentrations have been increasing since the beginning of the industrial period, causing most of the current ∼1 ∘C temperature increase above the average global temperature in the period 1861–1880 (Stocker et al., 2013). The temperature increase limit of 2 ∘C set by the Paris Agreement for 2100 requires substantial reduction of GHG emissions in the next decades and, consequently, significant reductions in the rates of GHG concentration increases. Predicting how GHG concentrations will vary in the future requires a clear understanding of the biogeochemical processes responsible for their variations. However, models of future long-term climate changes predict a large range in GHG concentrations for a given scenario of emissions (Friedlingstein et al., 2014), and one of the key uncertainties is associated with feedbacks in the coupled carbon–climate system (Arora et al., 2013). Climate modellers have analysed and compared results from state-of-the-art climate model simulations to gain insights into the processes of climate variability, change, and feedbacks through the Coupled Model Inter-comparison Project (CMIP). In CMIP, records of GHGs can be used as either forcing or a diagnostic (Graven et al., 2017; Meinshausen et al., 2017). However, real-time records of GHGs started in a period when anthropogenic forcing was already very significant, and the atmosphere and the Earth system were in strong disequilibrium, and therefore do not provide a balanced state for model spin-up. Additionally, temperature and CO2 have both increased almost continuously through the 20th century, making it difficult to separate the impacts of CO2 on carbon sinks from the impacts of temperature increase on these sinks. Furthermore, real-time records are often too short to draw strong conclusions on multi-decadal variability. 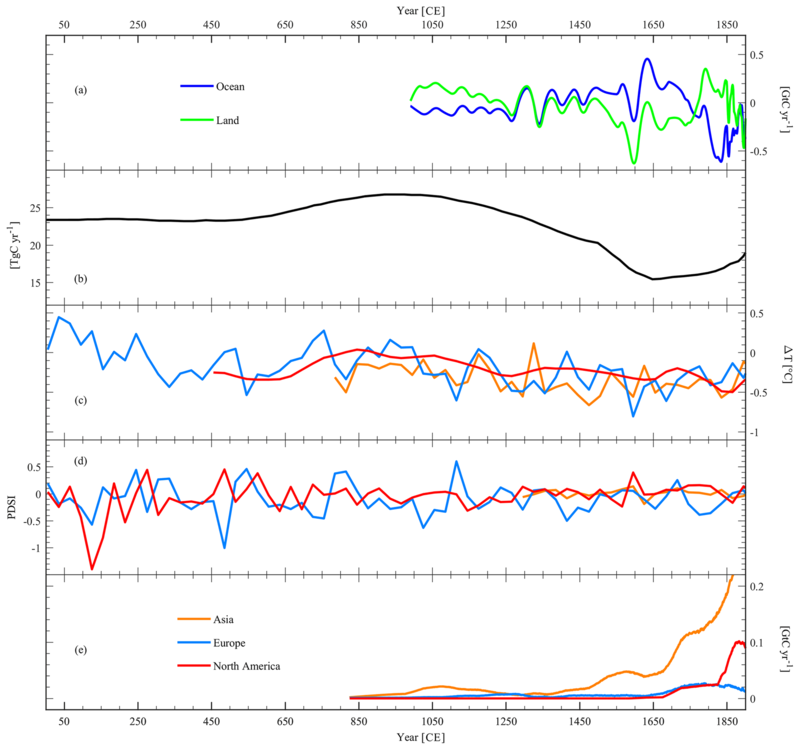 To provide a balanced system for model spin-up, and evaluate the ability of models to capture observed variability on multi-decadal and longer timescales, a branch of CMIP (“Historical Simulations”) starts in 1850 CE (Eyring et al., 2016), while another branch (the “Paleoclimate Modelling Intercomparison Project”, PMIP) focuses on paleo-climate simulations (Schmidt et al., 2014). Yet, policymakers need short-term predictions of global warming (next decades to century), and the Intergovernmental Panel on Climate Change has very recently provided a special report on the impacts of global warming of 1.5 ∘C above pre-industrial levels. The last millennium is a very suitable period to support these types of investigations since the Earth system was much closer to its current state than previous periods of glacial–interglacial transition. N2O from EUROCORE and GRIP in Greenland (Flückiger et al., 1999), Dome C (Flückiger et al., 2002), and Law Dome (MacFarling Meure et al., 2006) in Antarctica. There are other records focusing on periods other than the last centuries but also covering the whole or part of the industrial and the pre-industrial periods (i.e. for N2O: H15 by Machida et al., 1995; Styx glacier by Ryu et al., 2018; Talos Dome by Schilt et al., 2010). We have decided not to include them in our comparison because their temporal resolution (Schilt et al., 2010) and/or coverage (Machida et al., 1995; Ryu et al., 2018) limits their value for comparison with the records focusing on the last centuries. There are real differences between records of the same GHG from different sites caused by atmospheric features, such as the inter-hemispheric gradient (north–south or Greenland vs. Antarctica). The inter-hemispheric gradient is different from one GHG to another, depending on the balance between, and the distribution of, sources and sinks for that specific GHG in the two hemispheres, as well as on the atmospheric circulation and the atmospheric lifetimes of the gases. There are also differences which do not reflect atmospheric changes, due, for example, to the characteristics of the sites where the ice is sampled. Ice core site characteristics influence the measured gas records due to the gaseous diffusion through the uppermost layers of porous, compacting snow, the “firn” (Schwander et al., 1993). Together, diffusion in firn and gradual bubble close-off result in a smoothed representation of the atmospheric history in ice core gas records. The smoothing process depends on the depth of the firn layer and on how quickly bubbles close off and trap air during firn-to-ice transition. Ice core sites in Greenland generally have higher accumulation rates and temperatures than in Antarctica. Consequently, GHG records from many Antarctic sites are usually a more smoothed representation of the atmospheric history. Unfortunately, there is no reliable CO2 record available from Greenland because there is evidence of in situ production of CO2 (Anklin et al., 1995; Barnola et al., 1995). The most likely explanation for this is a high level of impurities in Greenland ice reacting with acidity and/or hydrogen peroxide (Jenk et al., 2012; Tschumi and Stauffer, 2000). Law Dome, Antarctica, provides the best time-resolved ice core records due to the very high accumulation rate at this site (Etheridge et al., 1996; Goodwin, 1990), even more so than Greenland. Also, records from multiple Law Dome sites show no evidence of in situ production because they agree with records from colder sites in Antarctica (Rubino et al., 2016; Siegenthaler et al., 2005) and compare closely with each other, with air extracted from the firn, and with modern atmospheric records (Rubino et al., 2013). However, there are unexplained differences between records of the same GHG, particularly for CO2. For example, while the CO2 records of the South Pole and EDML over the last centuries are consistent with Law Dome when their broader age smoothing is taken into account (Rubino et al., 2016; Siegenthaler et al., 2005), the WAIS CO2 record is on average 3 ppm higher than the Law Dome CO2 record (Ahn et al., 2012). The similarity between the high-frequency variations in the CH4 records from Law Dome and WAIS (Mitchell et al., 2011) suggests that the two sites (Law Dome and WAIS) introduce similar smoothing of the atmospheric signals. However, the Law Dome CO2 minimum measured around 1610 CE does not have a corresponding feature at WAIS (Ahn et al., 2012). Considering that a comparison between the two laboratories where Law Dome and WAIS samples were measured has shown no significant offset (Ahn et al., 2012), the differences between the WAIS and the Law Dome CO2 records could be explained by a small effect of in situ production at WAIS. Additionally, there is a significant difference in the mean pre-industrial level of δ13C-CO2 measured at WAIS and Law Dome (Bauska et al., 2015; Rubino et al., 2016). These differences need to be resolved with inter-calibration campaigns between different laboratories, using ice cores from different sites (including new high-accumulation cores) and accurate modelling of gas age (both the mean value and spread) at each site. To provide the most consistent datasets possible for the past centuries, we have previously compared the Law Dome records of CO2, CH4, N2O, and δ13C-CO2 to firn and modern atmospheric measurements (MacFarling Meure et al., 2006; Rubino et al., 2013). The consistency between these measurements is evidence of our ability to extend current atmospheric records back in time using ice and firn. However, because of the emissions during the Industrial Revolution, our measurements of modern and old (pre-industrial) air samples lie in different concentration ranges and the calibrations used for measurements of modern air samples are, therefore, in a concentration range rather different from that used for measurements of old air samples. The measurements performed in ICELAB–GASLAB at CSIRO have the advantage of being calibrated across the range of concentrations of old and modern air sample measurements. Also, ice core gas extractions and analyses are technically challenging, and different people at CSIRO ICELAB have produced those measurements over almost 3 decades. Thus, it is possible that the extraction and analysis procedures have introduced different biases over time, influencing the measurements by variable amounts. However, except for minor developments over time (Etheridge et al., 1996; Francey et al., 1999; MacFarling Meure et al., 2006; Rubino et al., 2013, 2016) the equipment used for extraction and analysis has not fundamentally changed. In this study, we describe the procedure recently developed at CSIRO ICELAB–GASLAB to perform calibration-scale updates and data selection and correction automatically and in a consistent way for all measurements made over the last 25 years. In the Supplement, we provide a detailed explanation of the database recently created to store, process, and extract the information about the samples analysed, the measurements performed, and the results obtained. We present updated records of CO2, CH4, N2O, and δ13C-CO2 measured in ice and firn air from Law Dome (Rubino et al., 2019). After merging them with other relevant records, they will be used to run models participating at CMIP6 (Graven et al., 2017; Meinshausen et al., 2017). We discuss the strengths and limitations of the Law Dome GHG records and compare our records with other records from different sites to show similarities and unresolved discrepancies. Finally, we discuss the main features of those records, their implications for biogeochemical, atmospheric, and climatic studies, and possible future lines of research. 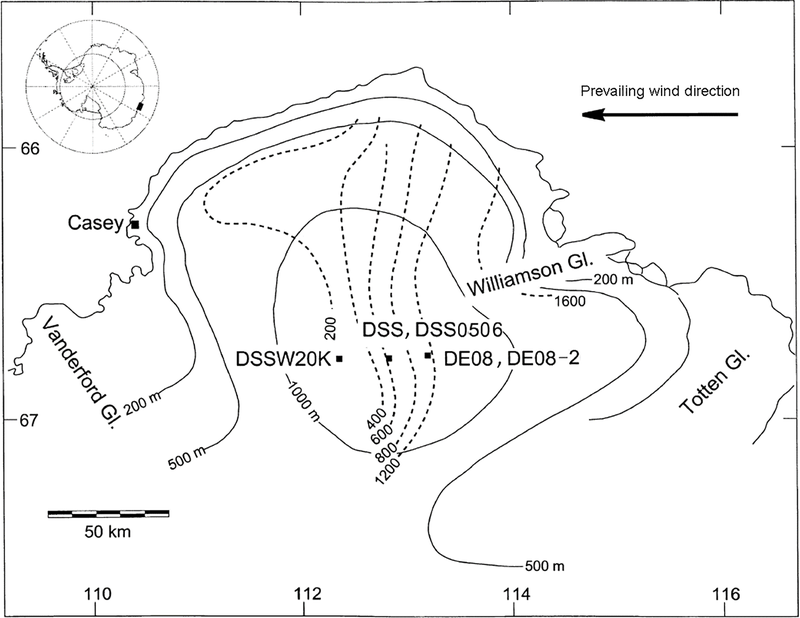 The ice cores used in this study, referred to as DE08, DE08-2, DSS, and DSS0506, were drilled at Law Dome, East Antarctica (Fig. 1). Law Dome is a relatively small (∼150 km diameter and 1390 m high) ice sheet on the coast of Wilkes Land. It receives large and regular snowfall mainly from the east, and the surface rarely melts in the colder central regions. The ice flow is mainly independent of the flow of the main East Antarctic ice sheet because of the drainage around Law Dome by two glacier systems (the Totten and the Vanderford). Reworking of the accumulated snow is insufficient to erase annual layers as high wind speeds are relatively infrequent. The resulting annual layering is thick and regular and preserved for much of the ice thickness (van Ommen et al., 2005). Figure 1Map of the Law Dome region, slightly modified from Smith et al. (2000), showing the location of the drilling sites DE08, DE08-2, DSS, DSS0506, and DSSW20K discussed in the text. Dotted lines are accumulation isopleths (kg m−2 yr−1) and unbroken lines are elevation contours (m a.s.l.). The inset shows the location of the region in Antarctica. DE08 and DE08-2 were drilled in 1987 and 1993, respectively, only 300 m apart and 16 km east of the summit of Law Dome (66∘44′ S, 112∘50′ E, 1390 m a.m.s.l. – above mean annual sea level), and have an accumulation rate of approximately 1100 kg m−2 yr−1 (equivalent to 1.4 m of ice per year). DSS (Dome Summit South) was drilled between 1988 and 1993, 4.6 km south-southwest of the summit, and has an accumulation rate of about 600 kg m−2 yr−1 (Etheridge et al., 1996; Goodwin, 1990; van Ommen et al., 2005). In January–February 1993, air was sampled from the firn layer at DE08-2, providing air with mean ages back to 1976 CE (Etheridge et al., 1996). Another firn campaign was carried out at DSSW20K (accumulation rate of approximately 150 kg m−2 yr−1), 20 km west of DSS in December 1997 (Sturrock et al., 2002), which provided air dating back to about 1940 CE (Trudinger et al., 2002b). 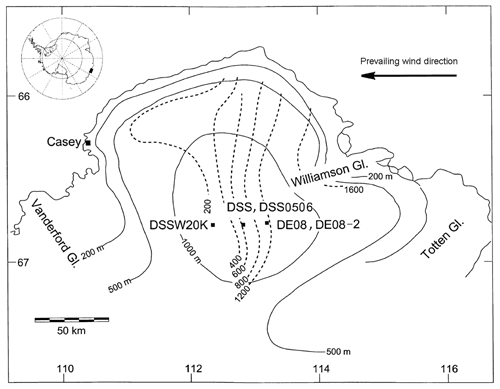 DSS0506 was thermally drilled in a dry hole (Burn-Nunes et al., 2011) during the 2005/2006 austral summer near the Law Dome summit (66∘46′ S, 112∘48′ E, 1370 m a.s.l.). The site has an accumulation rate of about 600 kg m−2 yr−1 and a mean annual temperature of −22 ∘C. Measurement of the composition of air in ice core bubbles requires an extraction step to release the air from ice. The dry extraction technique used at ICELAB has been described in detail in previous publications (Etheridge et al., 1996; MacFarling Meure et al., 2006), with recent minor alterations to optimise extraction and measurement of δ13C-CO2 analyses (Rubino et al., 2013). Briefly, after ice sample selection and preparation (removing the outer 5–20 mm with a band saw), typically 0.7–1.3 kg of ice is placed in a polyethylene bag (Layflat, USP®) and cooled down to −80 ∘C in a chest freezer for at least 24 h prior to extraction. The ice is then placed inside a perforated inner cylinder (“cheese grater”) fixed inside an internally electropolished stainless steel container, which is then evacuated to less than 10−2 Pa and maintained at that pressure for at least 25 min. The ice is then grated by mechanically shaking the container for 10 min, which releases the trapped air. The process yields on average 70 mL (range 50–90 mL) of air, estimated from the pressure in the extraction line (whose volume has been previously calibrated). The air is passed through a water vapour trap (∼-100 ∘C) and then cryogenically collected in an electropolished and preconditioned stainless steel trap at around 20 K (−253 ∘C). The sample trap is warmed in a water bath at room temperature (∼25 ∘C) for 5 min to vaporise and mix the gases before being transported into the instrument laboratory. Samples are analysed on gas chromatographs (GCs) for CO2, CH4, CO, H2, and N2O within 24 h after extraction, and on the isotope ratio mass spectrometer (IRMS) for δ13C and δ18O within 12 h.
To estimate the uncertainty and any possible bias introduced by the extraction procedure (called the blank correction), test samples are run together with the real ice samples. The test samples can be either reference air samples of known composition processed with no ice present (named “blanks”) or reference air samples injected over ice grown with no visible bubbles in it and grated as for an actual ice core sample (the so-called bubble-free ice, or BFI). BFI is grown in ICELAB by keeping a container filled with deionised water in thermal equilibrium, in order to grow ice as slowly as possible from the bottom to the top of the container. The container features Plexiglas sidewalls that are electrically heated. The water exchanges heat only through the metallic base and freezes from the bottom to the top. If the process is slow enough, the produced ice is free of visible bubbles. The results of the tests performed on ICELAB BFI, as well as on other externally grown BFI, have been extensively described by Rubino et al. (2013). Each extracted air sample is analysed for trace gas concentrations (defined as mole fractions in parts per million (ppm) or parts per billion (ppb) in dry air) using several GCs in GASLAB. A Series 400 CARLE/EG & G (Tulsa, Oklahoma, USA) GC equipped with a flame ionisation detector is used to measure CH4 and CO2 (the latter converted, after column separation, to CH4 using a nickel catalyst at 400 ∘C). A Trace Analytical RGA3 (Menlo Park, California, USA) GC, equipped with a mercuric oxide reduction gas detector, is used to measure CO and H2, which reduces HgO to gaseous Hg for detection by UV absorption. N2O is measured on a Shimadzu GC-8AIE (Kyoto, Japan) equipped with an electron capture detector. In normal GASLAB operation, air samples (including those sampled from firn) in low-pressure flasks and high-pressure cylinders are injected and analysed on the GCs using automated inlet systems to ensure reproducibility and minimum sample consumption (Francey et al., 2003). Because of the limited amount of air available, a semi-automated procedure is used to inject the small volume of ice core air into the GC inlet systems. Approximately 15–20 mL is used to measure CO2, CH4, CO, and H2, and 12–15 mL is used to measure N2O. The remaining air (typically 40 mL) is used for δ13C and δ18O measurements. The volumes indicated are total volume used for flushing gas transfer lines as well as for analysis. When comparing measurements performed more than 20 years apart, rigorous traceability in the propagation of calibration scales becomes an important factor. This is obtained with a long-term, continuous comparison of standard cylinders for both GC (Francey et al., 2003) and IRMS (Allison and Francey, 2007) analyses. The current calibration scales used are WMO X2004A for CH4, WMO X2007 for CO2, NOAA 2006A for N2O, and CSIRO2005 for CO2 isotopes (CO2-in-air scale, which is linked to the VPDB CO2 scale). A new database allows storage, selection, correction, updating and extraction of the data produced in ICELAB–GASLAB. It allows results to be dynamically updated if changes in analytical methods or calibration scales are implemented, keeping ice, firn, and atmospheric measurements consistent with each other. Data are stored in tables where the information associated with each specific sample is linked via a Universal Analysis Number (UAN) that acts as the index for combining all information. The structure of the database and its tables are described in detail in the Supplement. The database includes procedures, which automatically perform sample selection, correct results and estimate uncertainty, and provide a routine for data extraction (see Supplement for details). The first pre-industrial record of CO2 from Law Dome covering the whole last millennium was published by Etheridge et al. (1996, reported here with red squares in Figs. 2a and 3a). It was one of the first ice core records to show the overlap with firn (Fig. 3a) and contemporary atmospheric measurements. The overlap of ice core and contemporary atmospheric measurements is one of the main advantages of the Law Dome ice core sites, due to their high snow accumulation rates and the resultant relatively quick bubble close-off time and recently enclosed air. This feature has been described extensively in previous papers (Etheridge et al., 1996; MacFarling Meure et al., 2006; Rubino et al., 2013) and used, together with the overlap between different cores, to demonstrate our confidence in extending contemporary GHG concentration measurements back in time. Based on replicate analyses of test samples (blanks and BFI) over time periods of several months, on ice samples within an annual layer, and the overlap mentioned above, Etheridge et al. (1996) estimated that the uncertainty of the CO2 measurements was 1.2 ppm (1σ). The major biogeochemical events discussed in Etheridge et al. (1996) were the LIA (Little Ice Age) CO2 decline between 1550 and 1750 CE with the subsequent recovery from the LIA perturbation between 1750 and 1800 CE in the pre-industrial period, and the 1940s stabilisation of atmospheric CO2 concentration (Fig. 3a), which ended just before the Mauna Loa and South Pole atmospheric records began. Figure 2Published pre-industrial period (1–1900 CE) GHG records from Law Dome ice extracted and measured at CSIRO ICELAB–GASLAB. (a) CO2, (b) CH4, (c) δ13C-CO2, and (d) N2O. 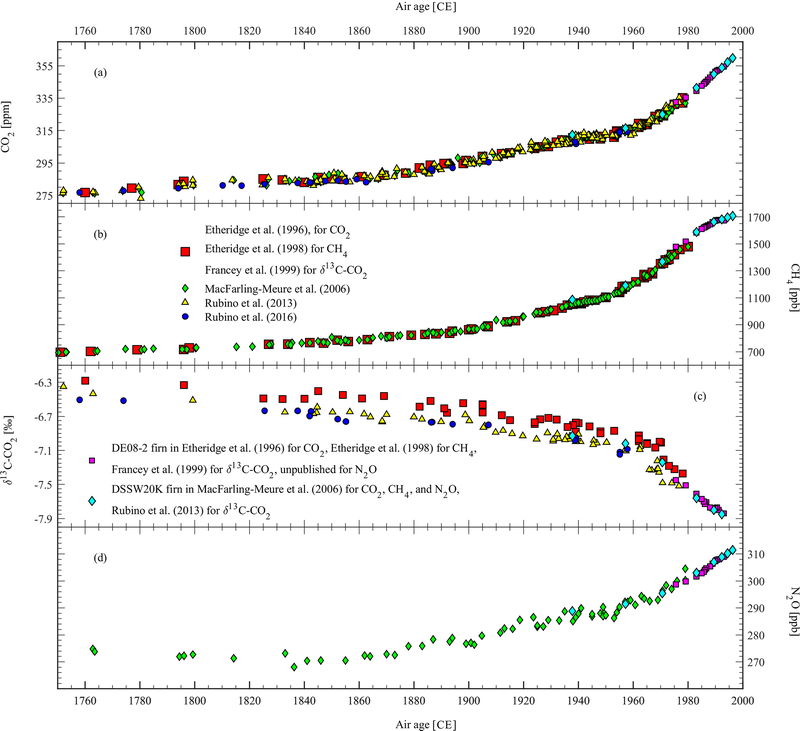 Figure 3Published and unpublished industrial period (1750–2000) GHG records from Law Dome ice and firn, extracted and measured at CSIRO ICELAB–GASLAB. (a) CO2, (b) CH4, (c) δ13C-CO2, and (d) N2O. A few years later, the same authors published the Law Dome pre-industrial record of CH4 covering the last millennium (Etheridge et al., 1998, red squares in Figs. 2b and 3b). The tight overlap for the first time between ice, firn and contemporary atmospheric CH4 measurements that began more than 20 years later than for CO2 confirmed that the ice core air record is a faithful representation of the past atmospheric CH4 concentration (Fig. 3b). The estimated uncertainty was 5 ppb. The major features discussed in Etheridge et al. (1998) were the LIA CH4 decline, supporting a terrestrial origin for the synchronous CH4∕CO2 decrease, and the rapid increase in CH4 growth rates after 1945 CE, which peaked in 1981 CE, just as atmospheric monitoring began. It was also possible to determine the pre-industrial inter-hemispheric difference in CH4 (24–58±10 ppb), based on comparison with CH4 measurements from Greenland (EUROCORE and GISP2), also made in ICELAB–GASLAB, and supporting evidence from Blunier et al. (1993) and Chappellaz et al. (1997). The variability over time of the CH4 pre-industrial inter-hemispheric gradient provides a constraint to quantify variations in sources and sinks of CH4 (Mitchell et al., 2013). The same is not possible for CO2 because of the above-mentioned in situ production in Greenland ice. To quantify variations in the sources and sinks of CO2, Francey et al. (1999) measured its isotopic ratio (δ13C, red squares in Figs. 2c and 3c) in Law Dome ice. This record provided a means to quantify the relative CO2 uptake by the land and the ocean to the total atmospheric CO2 change (Trudinger et al., 2002a), when the emissions from fossil fuel and land use change were taken into account for the industrial period, and assuming that, in the pre-industrial period, there was no significant influence of anthropogenic activities on the atmospheric δ13C-CO2 (Pongratz and Caldeira, 2012; Stocker et al., 2011), and also assuming no significant changes in inter-hemispheric CO2 exchange times (Francey and Frederiksen, 2016; Frederiksen and Francey, 2018). The δ13C-CO2 decrease measured by Francey et al. (1999) in the last 2 centuries (Fig. 3c) is mainly due to 13C-depleted CO2 derived from fossil fuel CO2 emissions and is important evidence of the prominent role of anthropogenic emissions in the industrial period CO2 increase. Francey et al. (1999) also discussed the increase in δ13C-CO2 during the LIA, supporting the interpretation of a terrestrial origin for the synchronous CH4∕CO2 decrease (Trudinger et al., 1999), though with lower sampling resolution compared to the CO2 in Etheridge et al. (1996). Francey et al. (1999) estimated statistical and systematic δ13C-CO2 biases between 0.025 and 0.07 ‰ and uncertainties of up to ±0.05 ‰ but found an unexplained discrepancy of up to 0.2 ‰ (Trudinger, 2000, Sect. 3.8) around 1900 CE from the South Pole δ13C-CO2 firn record measured at NOAA INSTAAR (National Oceanic and Atmospheric Administration Institute of Arctic and Alpine Research, Boulder, Colorado). The early Law Dome GHG records have been revised and extended over time as follows. MacFarling Meure et al. 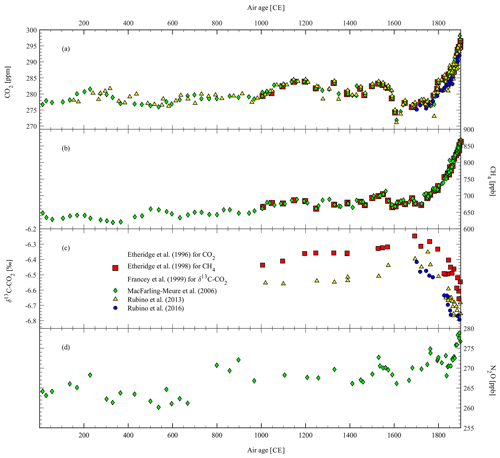 (2006) extended the CO2 and CH4 records back through the last 2 millennia (green diamonds in Fig. 2a and b) and increased sample density in the industrial period (green diamonds in Fig. 3a and b). They also confirmed the LIA CO2∕CH4 decrease as well as the 1940s CO2 stabilisation and produced a record of N2O (green diamonds in Fig. 2d) which, in turn, overlaps with firn N2O measurements (green diamonds in Fig. 3d). The authors interpreted the N2O decrease of about 5 ppb during the LIA as additional evidence for the terrestrial origin of the LIA GHG decrease. The measurement uncertainty remained the same for CO2 (1.2 ppm) as for Etheridge et al. (1996) but decreased slightly for CH4 (from 5 ppb in Etheridge et al., 1998, to 4 ppb in MacFarling Meure et al., 2006). The uncertainty of the N2O measurements was 6.5 ppb. The authors also found an increase in N2O concentration of about 10 ppb between 675 and 800 CE, which does not seem to be related to any known climatic event. Rubino et al. (2013) revised the δ13C-CO2 record (see yellow triangles in Figs. 2c and 3c) by updating the calibration scale and revisiting the corrections applied in Francey et al. (1999) for blank, gravity, and diffusion effects, using the revised CSIRO firn model (Trudinger et al., 2013) for the gravity and diffusion corrections (Trudinger et al., 1997). In doing so, they resolved the 0.2 ‰ discrepancy found between the Law Dome δ13C-CO2 record and the South Pole δ13C-CO2 firn record (the South Pole firn records have been reported in Fig. 5, but see Rubino et al., 2013, for more details). They also increased sample density during the industrial period and applied the new chronology available for Law Dome ice (Plummer et al., 2012), which caused a shift of about 150 years for samples that are 2000 years old (see difference between the ages of green diamonds and yellow triangles in Fig. 2a). The age difference becomes negligible in the last millennium, as evident by comparing red squares and yellow triangles in Fig. 2c. Rubino et al. (2016) carried out additional CO2 and δ13C-CO2 measurements (see blue circles in Figs. 2–3a and c) from ice cores sampled at the Law Dome site of DSS0506 (Pedro et al., 2011). The data extended back to 1700 CE effective air age and provided additional evidence of consistent results between different ice cores and firn records where they overlapped. However, the increasing CO2 trend measured in DSS0506 between 1700 and 1850 CE does not tightly match that previously attributed to recovery from the LIA (Etheridge et al., 1996). It is also worth mentioning the results of two other studies performed using Law Dome ice and firn, which were sampled but not measured using CSIRO GASLAB instruments. To investigate changes in pre-industrial sources of CH4, Ferretti et al. (2005) produced a record of δ13C-CH4 in Law Dome ice covering the last 2000 years (not shown). They reported unexpected changes of the global CH4 budget, mainly attributed to variations in biomass burning emissions during the late pre-industrial Holocene (LPIH) through an atmospheric box model (Lassey et al., 2000). The δ13C-CH4 record from Ferretti et al. (2005) has not been included in ICEBASE because the air samples extracted in ICELAB were measured on a mass spectrometer not maintained by CSIRO GASLAB. Therefore, the δ13C-CH4 data are not on a CSIRO calibration scale and have not been included in ICEBASE. Park et al. (2012) measured oxygen and intramolecular nitrogen isotopic compositions of N2O (not shown) covering 1940 to 2005 in Law Dome firn air and archived air samples from Cape Grim (Tasmania). In doing so, they confirmed that the rise in atmospheric N2O levels is largely the result of an increased reliance on nitrogen-based fertilisers. These isotopic measurements are also not included in ICEBASE. 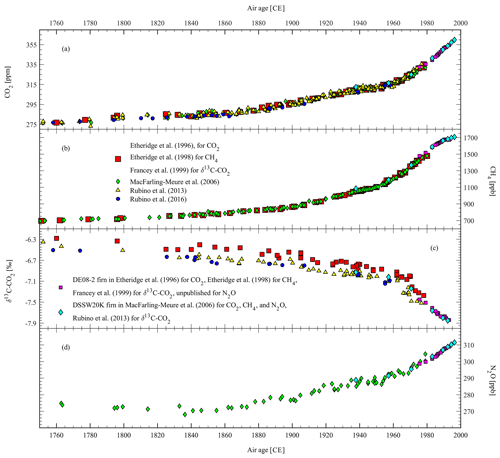 Figure 4Revised records (100–1900 CE) of (a) δ13C-CO2, (b) CO2, (c) CH4, and (d) N2O from Law Dome ice compared to published records from other sites: WAIS δ13C-CO2 from Bauska et al. (2015), WAIS CO2 from Ahn et al. (2012), DML CO2 and δ13C-CO2 from Rubino et al. (2016), EDML and South Pole CO2 from Siegenthaler et al. (2005), WAIS CH4 from Mitchell et al. (2011), NEEM CH4 from Rhodes et al. (2013) plotted using the revised age scale as explained in the text, GISP2 CH4 from Mitchell et al. (2013), EUROCORE and GRIP N2O from Flückiger et al. (1999), and EDC N2O from Flückiger et al. (2002). Figures 4 and 5 show the newly revised Law Dome GHG records (red circles). Following the rule-based selection described in the Supplement, there are 299 ice core measurements for CO2, 307 for CH4, 147 for N2O (compared to 212, 228, and 103, respectively, in MacFarling Meure et al., 2006), and 86 for δ13C-CO2 (compared to 58 in Francey et al., 1999, and 69 in Rubino et al., 2013). All of the major features described in previous publications are retained. However, the differences mentioned above can potentially influence the biogeochemical and climatic interpretation of these records. Given that the Law Dome GHG records are a major source of information for models used to predict the future behaviour of the Earth system (Graven et al., 2017; Köhler et al., 2017b; Meinshausen et al., 2017), in the following paragraphs we provide an explanation of the main reasons for these differences. Changes to the calibration scale result in small, mostly negligible, differences. All records (except the δ13C-CO2) start in 154 CE (effective age for CO2) rather than 0 CE. This causes a revision of air ages towards more recent times for all events recorded in the second-to-last millennium (e.g. the 10 ppb increase in N2O between 675 and 800 CE discussed in MacFarling Meure et al. (2006) is now dated 701–822 CE, Fig. 4d) but a less than 2-year change in dating after about 1000 CE. Each data point has an uncertainty, which is independently calculated based on the weighting and flagging systems described in the Supplementary Material. The uncertainty does not include any additional uncertainty associated with inter-core variability. For example, based on comparisons between samples of the same ages, the discrepancy found between DSS0506 and other Law Dome cores in the period 1700–1850 CE suggests that the inter-core variability can potentially add a random, extra uncertainty of up to 5 ppm for CO2. Further research is needed to precisely quantify the inter-core variability. 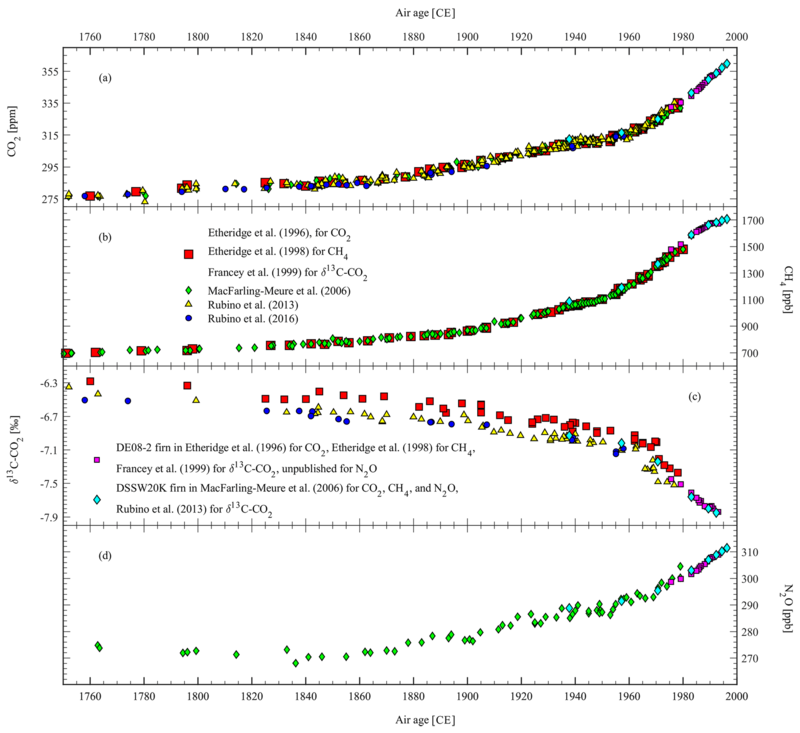 Figure 5Revised records (1750–2010 CE) of (a) δ13C-CO2, (b) CO2, (c) CH4, and (d) N2O from Law Dome ice and firn compared to the South Pole firn records of δ13C-CO2, CO2, and N2O (measured at NOAA-INSTAAR) and to published records from other sites: WAIS δ13C-CO2 from Bauska et al. (2015), WAIS CO2 from Ahn et al. 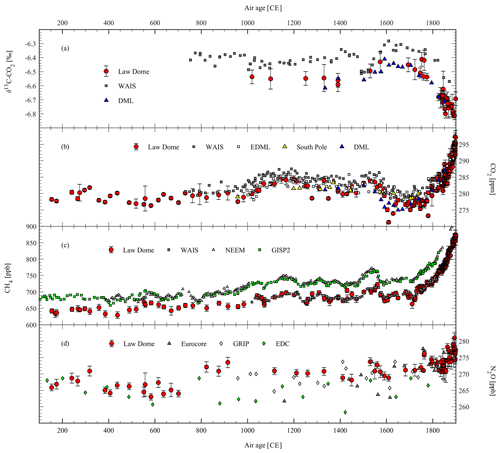 (2012), DML CO2 and δ13C-CO2 from Rubino et al. (2016), EDML and South Pole CO2 from Siegenthaler et al. (2005), WAIS CH4 from Mitchell et al. (2011), NEEM CH4 from Rhodes et al. (2013), GISP2 CH4 from Mitchell et al. (2013), and EUROCORE N2O from Flückiger et al. (1999). The following list compares the new Law Dome records with records from other sites and discusses the main differences. There is good agreement between the revised CO2∕δ13C-CO2 Law Dome records and the CO2∕δ13C-CO2 records from DML produced in ICELAB–GASLAB (blue triangles in Figs. 4–5a and b). Once the different gas-age distributions of the ice cores are taken into account, the two records are in very good agreement, with a difference of less than 2 ppm for CO2 and differences within error bars for δ13C-CO2 (Rubino et al., 2016). Given that both records have been produced at CSIRO ICELAB–GASLAB, we can exclude any possible inter-laboratory offset. There is also acceptable agreement (random differences up to 4 ppm) between the CO2 Law Dome record and the CO2 records from EDML and the South Pole (Siegenthaler et al., 2005, white and green squares in Fig. 4b). Considering that the records have been produced in different laboratories (CSIRO ICELAB–GASLAB and University of Bern), it is possible that part of the difference is explained by an inter-laboratory offset. There is a systematic difference (3 ppm on average) between the Law Dome CO2 record and the WAIS CO2 record in the pre-industrial (Ahn et al., 2012, see grey squares in Fig. 4b). Though small, the difference is of concern because it is systematic throughout the whole record. The two laboratories (CSIRO ICELAB–GASLAB and Oregon State University) that produced these records have also run a comparison experiment to quantify the contribution of a possible inter-laboratory offset to the total discrepancy (Ahn et al., 2012). The good agreement (measurements from the two laboratories were consistent within the 1σ analytical uncertainty) found by the inter-comparison experiment suggests that the discrepancy is mostly due to an inter-core difference. There is an increase in this difference to >8 ppm between the Law Dome CO2 dip around 1610 CE and the WAIS CO2 decrease during the LIA (Ahn et al., 2012, compare grey squares and red circles in Fig. 4b). WAIS is considered a high-accumulation site and should retain the same events as those recorded at Law Dome. The difference is even more surprising when the tight agreement between the Law Dome CH4 record and the WAIS CH4 record (Mitchell et al., 2011) around this time is considered (compare red circles and grey squares in Fig. 4c). The consistency between the Law Dome and the WAIS CH4 record rules out dating issues or large differences in smoothing of the atmospheric signals between the two sites. This suggests a chemical origin (in situ production) of the CO2 discrepancy, which is more likely to occur for CO2 than for CH4. This interpretation is supported by additional evidence of 6 ppm discrepancy (Köhler et al., 2017b) during the Last Glacial Maximum, last termination, and Early Holocene between the EDC CO2 record (Monnin et al., 2001, 2004) and the WAIS CO2 record (Marcott et al., 2014). There is a difference of up to 0.15 ‰ (compare grey squares and red circles in Fig. 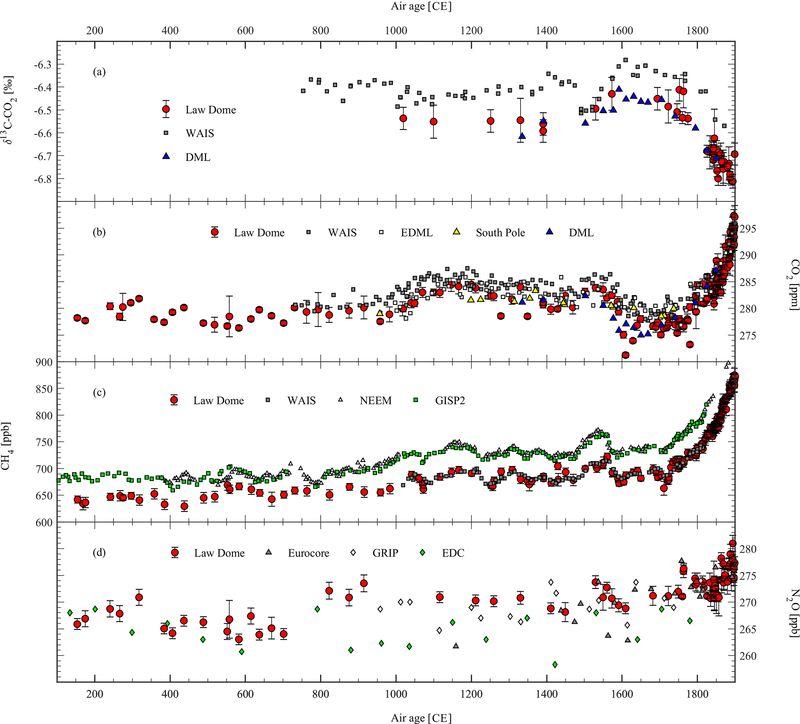 4a) between the Law Dome δ13C-CO2 record (Rubino et al., 2013) and the WAIS δ13C-CO2 record (Bauska et al., 2015). This difference is most likely due to an inter-laboratory offset but may also indicate a contribution from the CO2 discrepancy to its δ13C, or a combination of the two. It is not possible to quantify the inter-laboratory offset without running an inter-comparison study. However, it is possible to calculate a maximum effect of the in situ CO2 production on the δ13C measured at WAIS, assuming that the 3 ppm extra CO2 measured in WAIS (compared to an average pre-industrial CO2 concentration of 280 ppm measured at Law Dome) is totally due to the in situ production and that it all comes from carbonate carbon (δ13C = 0 ‰) because organic carbon with δ13C = −27 ‰ would make the WAIS δ13C-CO2 more negative than the Law Dome δ13C-CO2. Under this assumption, we calculate a possible shift of 0.07 ‰ through an isotope mass balance (=[0-(-6.55)]⋅3/283). This can only explain part of the discrepancy but can go up to 0.14 ‰ if an extra amount of 6 ppm is assumed (Ahn et al., 2012; Köhler et al., 2017b). The Bauska et al. (2015) record agrees within uncertainties with the Francey et al. (1999) dataset. However, Rubino et al. (2013) is the only record to show consistency with all firn records and direct atmospheric measurements (see Figs. 3c and 5a). This would suggest that the Rubino et al. (2013) study is currently the most accurate record and should be used to set a pre-industrial baseline. However, no definite conclusion can be drawn until a thorough inter-comparison study is carried out between the labs that have produced the WAIS and the Law Dome δ13C-CO2 datasets (Oregon State University-University of Colorado-Institute of Arctic and Alpine Research, INSTAAR and CSIRO). It is important to resolve the difference between the Law Dome and the WAIS δ13C-CO2 records in order to establish a pre-industrial baseline and, thus, a pre-industrial-to-industrial δ13C-CO2 difference. Setting a pre-industrial baseline could have consequences on the Last Glacial Maximum-to-pre-industrial δ13C-CO2 difference as well (Schmitt et al., 2012). These values are useful for biogeochemical interpretation (Broecker and McGee, 2013; Krakauer et al., 2006). As expected, the Law Dome and WAIS CH4 concentrations are lower than the NEEM high-resolution CH4 record (Rhodes et al., 2013, the white triangles in Fig. 4c show the median CH4 concentrations for 5-year time slices, after data outliers have been removed) by an amount which is consistent with an inter-hemispheric CH4 difference of 40–60 ppb (Mitchell et al., 2013). Interestingly, the LIA CH4 decrease measured at NEEM appears to start before the CH4 decrease measured at Law Dome and WAIS. The age scale of the NEEM CH4 record published in Rhodes et al. (2013) (Fig. 4c) has been revised with the updated ice-age scale published in Sigl et al. (2015) and the new estimate of Δage provided by Buizert et al. (2014). Mitchell et al. (2013) have synchronised the GISP2 CH4 record with the WAIS CH4 record to investigate changes of the interpolar difference in the pre-industrial based on the reasoning that “the multidecadal events observed in both ice core records must have occurred simultaneously since the durations of the events were much larger than the atmospheric mixing time (∼1 year)” (Mitchell et al., 2013). 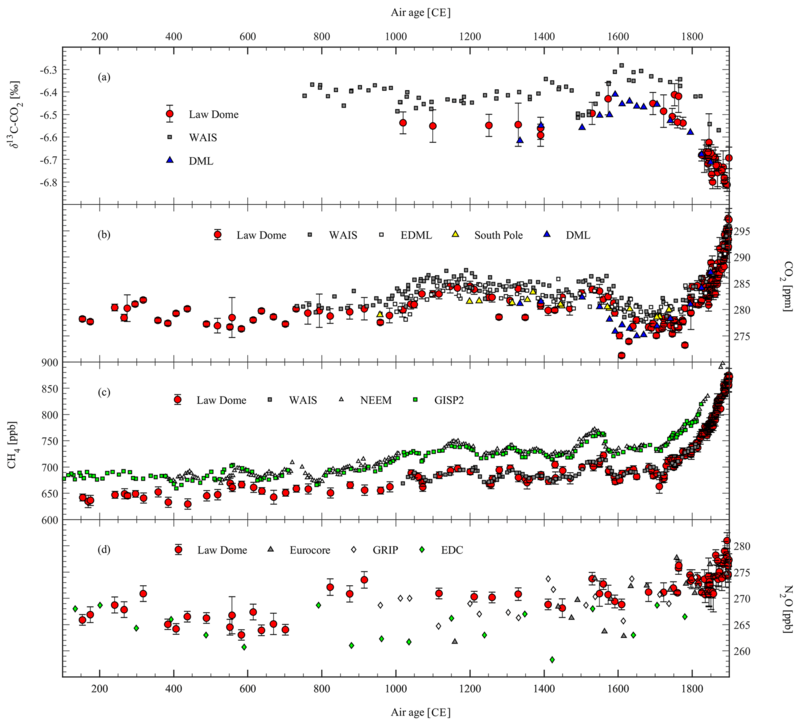 The NEEM CH4 record has not been synchronised with the others, and there are multiple possible reasons, including age scale issues, different smoothing of the atmospheric signals at the different sites, and inadequate sampling resolution, to explain the discrepancy found between the NEEM and the GISP2, Law Dome, and WAIS CH4 records during the LIA. A thorough investigation is out of the scope of this paper, but, in the future, this discrepancy should be resolved to obtain a precise synchronisation of all ice core records available over the LIA. The N2O records from Greenland (Flückiger et al., 1999, EUROCORE and GRIP, grey and white squares in Fig. 4d, respectively) and from EDC (Flückiger et al., 2002, green squares in Fig. 4d) show higher scatter than the Law Dome N2O record. All records need higher sampling resolution to investigate changes of atmospheric N2O concentration over the last centuries with more confidence. A new N2O record from a high-resolution site is required to explore the real variations in N2O in the pre-industrial period (Ryu et al., 2018). In an attempt to produce δ13C data around the Law Dome 1610 CE CO2 minimum (sparsely sampled by Francey et al., 1999) and confirm the interpretation of its terrestrial origin (Rubino et al., 2016; Trudinger et al., 1999), in 2012 we measured 18 samples from DSS, the only core from Law Dome covering the whole LPIH. The results both for CO2 and for δ13C are significantly lower than the spline fit to the revised records from Law Dome (results not shown). Conversely, the CH4 concentration measured is very consistent with the spline fit to the revised CH4 record. In the past, abnormally low CO2 concentration was interpreted as a sign of post coring melting (PCM), since CO2 is much more soluble than CH4. With PCM, the N2O concentration is usually low as well. However, in 7 of the 18 DSS samples that provided enough air to measure N2O, the N2O concentration was, on average, not significantly lower than the spline fit to the revised Law Dome record. This argues against the hypothesis of PCM. Another possibility is the effect of clathrate formation, which could alter CO2 and δ13C, but issues due to clathrate can be ruled out because none of the ice cores in this study reached depths or temperatures sufficient for clathrate formation, which can affect the extraction and measurement of enclosed gases and 13C-CO2 in particular (e.g. Schaefer et al., 2011). We do not have a definite explanation for the low CO2 and δ13C measured, but the results suggest that the DSS core may no longer be a reliable archive for CO2. This experiment was conducted while we were measuring the DSS0506 CO2 samples published in Rubino et al. (2016). During that survey, we also found a similar behaviour for 6 of the 34 DSS0506 samples measured. Since the two cores – DSS0506 and DSS – were stored in the same freezer in Hobart (Tasmania, Australia), with DSS0506 stored for a shorter period, we suggest the low CO2 may be a recent effect of storage (see Supplement to Rubino et al., 2016). The LIA, and particularly the 1610 CE CO2 event, is important for our understanding of the carbon cycle dynamics and the carbon–climate system in the past. It has been used to derive the CO2 sensitivity to temperature (Cox and Jones, 2008; Rubino et al., 2016), it is the most prominent biogeochemical event during the LPIH, and it has even been suggested as the beginning of the new geologic era called the Anthropocene (Lewis and Maslin, 2015). Therefore, it is of fundamental importance that we understand the amplitude of the minimum as recorded by the ice and the timing and likely size of the original atmospheric decrease before smoothing during firn diffusion and enclosure into bubbles. The Law Dome GHG records have been used for biogeochemical and climatic interpretation of changes in CO2 (Joos et al., 1999; Joos and Bruno, 1998; Rubino et al., 2013; Trudinger et al., 2002a), CH4 (Ferretti et al., 2005; Ghosh et al., 2015), and N2O (Park et al., 2012) over the past decades to millennia. They are also used as reference atmospheric GHG records for model simulations of the carbon–climate system of the LPIH (Graven et al., 2017; Köhler et al., 2017b; Meinshausen et al., 2017). Here we present an overview of the insight obtained through interpretation of the Law Dome GHG records and provide some perspective on the challenges we will have to face to obtain a deeper understanding of the carbon–climate system during the LPIH and the industrial period. The biogeochemical interpretation of GHG variations depends on quantifying their sources and sinks. The concentration of GHGs in the atmosphere is the net result of the processes releasing GHGs to the atmosphere (sources) and processes removing GHGs from the atmosphere (sinks). The atmospheric circulation then redistributes GHGs assuming consistency in the reasonably well-known patterns of air movement. Measuring the atmospheric concentration of GHGs provides one constraint on the net sources vs. sinks. However, generally, multiple sources and sinks act simultaneously. Therefore, multiple constraints are necessary to partition the contribution of each source or sink. Measuring the isotopic composition of each GHG provides an additional constraint (albeit usually with additional complexity), but there are also other independent constraints, such as the inter-hemispheric difference or evidence coming from other species, that help quantify the contribution of sources and sinks. Additionally, the net GHG emission strength is reflected in the rate of change in atmospheric concentration. Thus, ice core records that track rapid changes (i.e. high resolution) are best to infer budgets and hence biogeochemical information before direct atmospheric observations. The Law Dome records provide the highest resolution among existing Antarctic ice cores. There have been recent studies looking into the effects of firn microstructure (including density layers) on bubble trapping (Burr et al., 2018; Fourteau et al., 2017; Gregory et al., 2014; Mitchell et al., 2015). Improved understanding of these processes, how they affect smoothing of atmospheric GHG signals, and their incorporation into numerical models may lead to a more accurate quantification of the relationship between ice core GHG measurements at different sites and the original atmospheric variations. The two major reservoirs of CO2 that can change atmospheric concentrations over years to millennia are the terrestrial biosphere (land) and the oceans. Fossil fuel and land use emissions have added to these over recent centuries. Measurements of δ13C-CO2 have been used to quantify the contribution of land and ocean to the atmospheric CO2 variations measured (Joos et al., 1999; Joos and Bruno, 1998; Trudinger et al., 2002a). For example, the interpretation of CO2 and δ13C-CO2 variations through a double deconvolution (Fig. 6a) has identified the terrestrial biosphere as the main contributor to the LIA CO2 decline (Rubino et al., 2013, 2016; Trudinger et al., 2002a). This agrees with the findings of Bauska et al. (2015), who used the WAIS CO2 and δ13C-CO2 records to suggest that changes in terrestrial organic carbon stores best explain the observed multi-decadal variations in the δ13C-CO2 and in CO2 concentrations from 755 to 1850 CE. This agreement of interpretation from the DSS and WAIS records shows that what matters for the biogeochemical interpretation is the change in concentration over time, rather than the absolute concentration measured in different ice cores. The above studies assume consistency in the inter-hemispheric transport of Northern Hemisphere terrestrial emissions over multiple decades. Preliminary examination suggests Southern Hemisphere δ13C-CO2 records over the last decades are more susceptible to multi-year changes in the ratio of eddy to mean advective inter-hemispheric transport (Francey and Frederiksen, 2016; Frederiksen and Francey, 2018) than is the case for CO2 concentration, as a result of differences in isotopic equilibration that occur for the two transport modes. Figure 6Biogeochemical and climatic interpretation of the Law Dome GHG records: (a) atmospheric CO2 fluxes from (negative values on the y axis) and to (positive values on the y axis) the terrestrial biosphere (land: green line) and the ocean (blue line), resulting from the double deconvolution of CO2 and δ13C-CO2 (Rubino et al., 2016). (b) Flux of atmospheric CH4 from biomass burning (Ferretti et al., 2005). 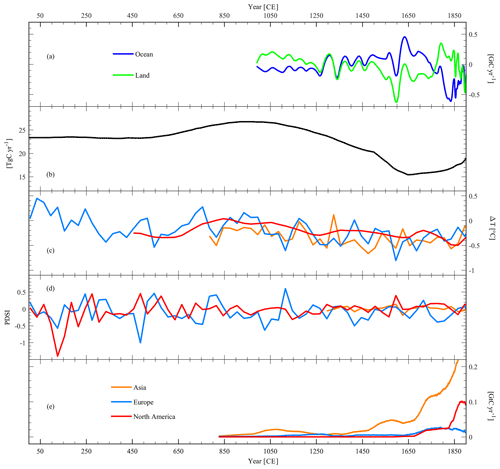 (c) Temperature variations in different continents in the Northern Hemisphere (Asia: yellow line; Europe: blue line; North America: red line) from Pages2k (2013). (d) Palmer Drought Severity Index (PSDI) of different continents in the Northern Hemisphere (Asia: yellow line; Europe: blue line; North America: red line) from Cook et al. (2009, 2010, 2015). (e) Atmospheric CO2 fluxes from different continents in the Northern Hemisphere (Asia: yellow line; Europe: blue line; North America: red line) due to pre-industrial land use change from Pongratz et al. (2012). An additional constraint for the biogeochemical interpretation of the LIA CO2 decrease has recently come from the new interpretation (Rubino et al., 2016) of the record of carbonyl sulfide (COS; Aydin et al., 2008) from the SPRESSO ice core (South Pole Remote Earth Science and Seismological Observatory) and modelling of its increase over the LIA (Rubino et al., 2016). Rubino et al. (2016) showed that the simultaneous COS increase during the LIA confirms that the LIA CO2 decline was caused by net terrestrial uptake due to cooling (heterotrophic respiration declining more than gross primary production, due to its higher sensitivity to temperature changes), though a very recent paper estimating the amount of carbon taken up by land use change following the colonisation of the Americas by the Europeans (Koch et al., 2019) provides a different view. Nonetheless, the multi-species approach used by Rubino et al. (2016, e.g. using trends of CO2, δ13C-CO2, and COS) can provide multiple constraints to help understand the biogeochemical processes behind atmospheric CO2 variations over the recent past. The 1940s CO2 plateau is a prominent feature in the industrial part of the Law Dome CO2 record and occurs at a time of continued fossil fuel emissions. Taking into consideration the smoothing effects of firn diffusion and bubble trapping on the rate of change in potential atmospheric signals, an uptake of around 2–3 GtC yr−1 between 1942 and 1949 would be required to explain the observed plateau. The Law Dome δ13C-CO2 measurements suggest that the oceans were responsible for at least two-thirds of this uptake (Rubino et al., 2013; Trudinger, 2000, Sect. 6.4; Trudinger et al., 2002a). Bastos et al. (2016) used the latest estimates of fossil fuel and land-use change emissions, ocean uptake reconstructions, and terrestrial models but were not able to explain the plateau, although they did not consider decadal variability in the ocean carbon sink that may have been important. Better understanding of the 1940s feature is needed to quantify how variable ocean and land carbon exchange can be on multi-year to decadal timescales and how this variability relates to climate variability. Improved understanding is expected to come from more high-precision, high-time-resolution ice core measurements to confirm δ13C-CO2 variation through the industrial period, additional constraints such as COS, better understanding of the smoothing effects on trapped air, and improved modelling of other influences on atmospheric δ13C-CO2 such as the effect of climate on isotopic discrimination (Randerson et al., 2002; Scholze et al., 2003). There are multiple natural sources–sinks of CH4: geological, wetlands, wildfires, termites, and ocean sediments are the main sources, while oxidation by tropospheric species (OH), oxidation by stratospheric species (OH, Cl, and O(1-D)), oxidation in soils and reactive chlorine in the marine boundary layer are the main sinks. Also for CH4, measurements of its isotopic composition (δ13C-CH4 and δD-CH4) have helped quantify the contribution of land vs. ocean to the measured atmospheric CH4 variations (Ferretti et al., 2005; Mischler et al., 2009; Sapart et al., 2012). However, because there are more distinct CH4 source types than isotopic tracers, and more spatially distributed sources than can be resolved by the geographically restricted suite of ice cores (despite the fact that the ice cores of Antarctica and Greenland are both known to provide reliable CH4 records), a unique solution for the history of CH4 sources is not possible. Nonetheless, the full suite of isotopic tracers and bipolar ice core data provides important boundary conditions for testing hypothetical CH4 source–sink histories, allowing elimination of large classes of scenarios. By measuring δ13C-CH4 in Law Dome ice, Ferretti et al. (2005) provided evidence of a remarkable decrease in pyrogenic CH4 during the last millennium (Fig. 6b). This interpretation was confirmed by Mischler et al. (2009) and Sapart et al. (2012), who measured both δ13C-CH4 and δD-CH4 in ice cores from Antarctica and Greenland, respectively. They also found an increasing agricultural source of CH4 throughout the last millennium, with most of the change occurring between the 1500s and the 1600s, supporting the hypothesis of a pre-industrial anthropogenic influence on atmospheric CH4. Additional source information is provided by measurements of carbon monoxide (CO) and its isotopes (δ13C-CO and δ18O-CO; Wang et al., 2010), through evidence of variations in biomass burning, and 14CH4, which identifies CH4 emissions from fossil sources. However, the measurement of 14CH4 is limited so far to large air samples extracted from firn (Lassey et al., 2007a, b) or from large ice samples collected where glacial-age ice outcrops at the surface (Petrenko et al., 2009, 2017). 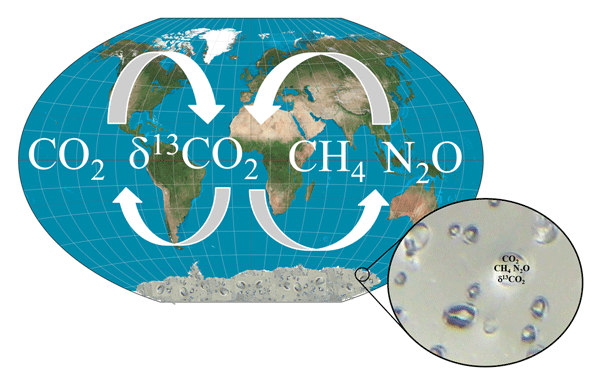 There are also multiple natural sources and sinks of N2O, both on land and in the ocean. The main sources are microbiological processes, especially in tropical soils, while the main sinks are photochemical reactions in the atmosphere. To the best of our knowledge, there are only two attempts to use δ15N-N2O and δ18O-N2O records to better constrain the land vs. ocean sources of N2O over the last century (Park et al., 2012; Prokopiou et al., 2017), and these used the larger volumes of air available in firn. Only one study (Prokopiou et al., 2018) has extended the investigation to the last millennia, but there is an analysis covering the last deglaciation by Schilt et al. (2014). As already mentioned, the pre-industrial inter-hemispheric N2O difference is also poorly constrained. Thus, there is room for vast improvement to understand the N cycle from measurements of N2O concentration and its isotopes in ice cores (Schilt et al., 2014). However, there is a risk of in situ production of N2O, especially in Greenland ice (Flückiger et al., 2002). 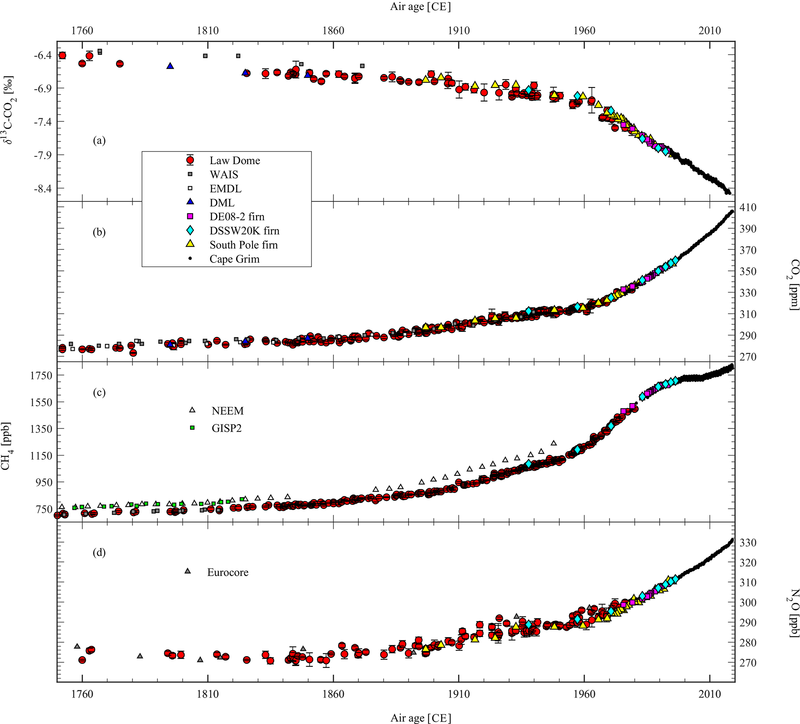 More records, with high sampling resolution, from both hemispheres are needed to confirm the features found in Law Dome (MacFarling Meure et al., 2006) and understand the causes of the changes in N2O concentration over time (Ryu et al., 2018). The climatic interpretation of the Law Dome GHG records has generally been carried out by comparing the timing of GHG variations and temperature changes and testing hypotheses of mechanistic relationships between the two with coupled carbon cycle–climate models. An important climatic event of the LPIH is the Medieval Climate Anomaly (MCA, roughly 950–1250 CE), which showed higher temperature in some regions (Goosse et al., 2005; Mann et al., 2009). During the MCA, there are generally higher levels of GHGs, but the timings of increase vary from one gas to another, with N2O showing a rise between 701 and 822 CE (well before the start of the MCA), CO2 increasing between 950 and 1200 CE, and CH4 showing some variability superimposed on a long-term increasing trend (Fig. 4b–d). The main climatic event of the last 2 millennia is the LIA (roughly 1400–1700 CE; Mann et al., 2008; Neukom et al., 2014; Pages2k, 2013). There is a clear decrease in all GHGs during the LIA, which, together with the other evidence mentioned above, suggests that all processes releasing GHG from land slowed down during the cold phase (Fig. 4b–d). However, as for the MCA, the change in concentration is not simultaneous for all GHGs. While both CO2 and N2O seem to decrease starting around 1550 CE (but N2O would need higher sampling resolution to confirm this), CH4 has a later decline, starting around 1580 CE. Also, the CH4 decrease seems to last for a shorter period of time, ending around 1610 CE, whereas the CO2 low is maintained longer, ending about 1750 CE. At the same time, there was a significant decrease in biomass burning (Ferretti et al., 2005; Mischler et al., 2009; Sapart et al., 2012; Wang et al., 2010), interpreted to be mostly a consequence of decreased fire emissions. While the relationship between CO2 and temperature variation has been used to infer the sensitivity of CO2 to temperature (Cox and Jones, 2008; Rubino et al., 2016), confirming and quantifying a positive feedback of terrestrial carbon with temperature (Rubino et al., 2016), it is now time to investigate the regional contribution to the total CO2 change, as attempted by Bauska et al. (2015), and the contribution from different processes within the terrestrial biosphere, such as net primary production, heterotrophic respiration, and biomass burning. There are regional (Mann et al., 2008), continental (Pages2k, 2013), and hemispheric (Neukom et al., 2014) temperature reconstructions that can be used to drive models describing the relationship between climate and carbon cycle to quantify the contribution from each region to the total CO2 decrease (Fig. 6c). There are also hydro-climatic reconstructions (Cook et al., 2009, 2010, 2015) providing evidence of dry and wet periods over the LPIH (Fig. 6d), which can be used together with records of charcoal (Marlon et al., 2013, 2016) and biomass burning tracers in ice cores (Grieman et al., 2017) to quantify the contribution of declining biomass burning in each region to the total CO2 decrease. The emissions from anthropogenic land use change have also been quantified for each world region (Pongratz and Caldeira, 2012; see Fig. 6e) and can be used to subtract the human contribution from the total CO2 change, even though there is a debate on the amount of land use change following the European colonisation of the Americas (Koch et al., 2019). We suggest that the LIA provides a suitable epoch to further study carbon cycle–climate feedbacks, for predictions of the future carbon–climate system, and particularly to understand the role of different regions of the world in changes of atmospheric chemistry and biogeochemical fluxes and carbon pools. The consequences of the LIA climatic changes on societal development are important for understanding why different communities were more or less vulnerable, resilient, or even adaptive (Degroot, 2018). Being able to quantify which regions have been more vulnerable to past climate change, also in terms of the response of the natural carbon cycle, could help plan future adaptation strategies. For each species, the calculated spline fit with time steps of 1 year and growth rate are also given. The spline fits attenuate variations with periods of less than 20 years by 50 % for CO2 and CH4, 100 years for N2O, and 50 years for δ13CO2. When using these data please consider citing the original publications from which the data underlying this compilation have been taken. The records of GHG (CO2, CH4, N2O) concentrations and the isotopic composition of CO2 (δ13C-CO2) from the Law Dome ice cores are among the most important sources of information for models trying to predict the future behaviour of biogeochemical cycles and their influence on the climate system. The records of CO2, CH4, N2O, and δ13C-CO2 are constantly being updated with new measurements and revised for changes in calibration scales and corrections for the effects of laboratory extractions and those of gravity and diffusion in firn. This paper has provided an in-depth explanation of the procedures used to extract and measure the samples in CSIRO ICELAB and store, correct, and select the results obtained. Given the widespread use of the datasets produced at CSIRO ICELAB–GASLAB, it is important to provide a track record of the reasons for changes carried out over time and keep the records open to the scientific community. This should help with their use in modelling and avoid misinterpretation (for example, the mistake spotted by Köhler et al., 2017a, in the paper from Machado and Froehner, 2017). we suggest that there is a need to sample a new, clean, and deep ice core from Law Dome, to confirm or improve our knowledge of the atmospheric LIA CO2 decrease and other rapid changes in atmospheric composition during pre-industrial millennia. Finally, there are open questions about the real size of past atmospheric variations in some species, such as N2O and COS, and the reasons for those variations, which, once resolved with new measurements, could provide additional understanding and insights, useful to better predict the future behaviour of biogeochemical cycles and their influence on the climate system. The supplement related to this article is available online at: https://doi.org/10.5194/essd-11-473-2019-supplement. MR conceived the database structure, performed measurements between 2009 and 2013, and led the writing of the paper. DME supervised the process, performed measurements, and collected samples. RH wrote the database queries and procedures in the Microsoft SQL server and developed the web-based user interface with Microsoft Visual Studio. DPT, CEA, RJF, RLL, LPS, and DAS carried out measurements of samples and standards in GASLAB and performed calibration scale updates. CMT carried out the numerical modelling, including the CSIRO firn model, the double deconvolution, and the spline fit to the data. MAJC, TDVO, and AMS collected, stored, and distributed samples and contributed to ice dating. We acknowledge the long-term support provided to this work by CSIRO, the Department of Energy and Environment, the Australian Antarctic Division and Australian Antarctic Program, and the many people involved in collecting the several ice cores and firn air samples from Law Dome since the 1980s. We thank Rachael Rhodes and Michael Sigl for providing updated ice and gas-age scales for NEEM. We also thank the two anonymous referees for their comments, which have helped improve the original paper. In particular, we acknowledge the enormous contribution of chief driller and close friend Alan Elcheikh (1960–2019), who sadly passed away during the production of this paper. This paper was edited by Thomas Blunier and reviewed by two anonymous referees. Ahn, J., Brook, E. J., Mitchell, L., Rosen, J., McConnell, J. R., Taylor, K., Etheridge, D., and Rubino, M.: Atmospheric CO2 over the last 1000 years: A high-resolution record from the West Antarctic Ice Sheet (WAIS) Divide ice core, Global Biogeochem. Cy., 26, GB2027, https://doi.org/10.1029/2011GB004247, 2012. Allison, C. E. and Francey, R. J.: Verifying Southern Hemisphere trends in atmospheric carbon dioxide stable isotopes, J. Geophys. Res., 112, D21304, https://doi.org/10.1029/2006JD007345, 2007. Anklin, M., Barnola, J. M., Schwander, J., Stauffer, B., and Raynaud, D.: Processes affecting the CO2 concentrations measured in Greenland ice, Tellus B, 47, 461–470, 1995. Arora, V. K., Boer, G. J., Friedlingstein, P., Eby, M., Jones, C. D., Christian, J. R., Bonan, G., Bopp, L., Brovkin, V., Cadule, P., Hajima, T., Ilyina, T., Lindsay, K., Tjiputra, J. F., and Wu, T.: Carbon-concentration and carbon-climate feedbacks in CMIP5 earth system models, J. Climate, 26, 5289–5314, https://doi.org/10.1175/JCLI-D-12-00494.1, 2013. Aydin, M., Williams, M. B., Tatum, C., and Saltzman, E. S.: Carbonyl sulfide in air extracted from a South Pole ice core: A 2000 year record, Atmos. Chem. Phys., 8, 7533–7542, https://doi.org/10.5194/acp-8-7533-2008, 2008. Barbante, C., Fischer, H., Masson-Delmotte, V., Waelbroeck, C., and Wolff, E. W.: Climate of the last million years: new insights from EPICA and other records, Quaternary Sci. Rev., 29, 1–7, https://doi.org/10.1016/j.quascirev.2009.11.025, 2010. Barnola, J. M., Anklin, M., Porcheron, J., Raynaud, D., Schwander, J., and Stauffer, B.: CO2 evolution during the last millennium as recorded by Antarctic and Greenland ice, Tellus B, 47, 264–272, 1995. Bastos, A., Ciais, P., Barichivich, J., Bopp, L., Brovkin, V., Gasser, T., Peng, S., Pongratz, J., Viovy, N., and Trudinger, C. M.: Re-evaluating the 1940s CO2 plateau, Biogeosciences, 13, 4877–4897, https://doi.org/10.5194/bg-13-4877-2016, 2016. Bauska, T. K., Joos, F., Mix, A. C., Roth, R., Ahn, J., and Brook, E. J.: Links between atmospheric carbon dioxide, the land carbon reservoir and climate over the past millennium, Nat. Geosci., 8, 383–387, https://doi.org/10.1038/ngeo2422, 2015. Blunier, T., Chappellaz, J. A., Schwander, J., Barnola, J.-M., Desperts, T., Stauffer, B., and Raynaud, D.: Atmospheric methane, record from a Greenland Ice Core over the last 1000 year, Geophys. Res. Lett., 20, 2219–2222, https://doi.org/10.1029/93GL02414, 1993. Broecker, W. S. and McGee, D.: The 13C record for atmospheric CO2: What is it trying to tell us?, Earth Planet. Sc. Lett., 368, 175–182, https://doi.org/10.1016/j.epsl.2013.02.029, 2013. Buizert, C., Martinerie, P., Petrenko, V. V., Severinghaus, J. P., Trudinger, C. M., Witrant, E., Rosen, J. L., Orsi, A. J., Rubino, M., Etheridge, D. M., Steele, L. P., Hogan, C., Laube, J. C., Sturges, W. T., Levchenko, V. A., Smith, A. M., Levin, I., Conway, T. J., Dlugokencky, E. J., Lang, P. M., Kawamura, K., Jenk, T. M., White, J. W. C., Sowers, T., Schwander, J., and Blunier, T.: Erratum: Gas transport in firn: Multiple-tracer characterisation and model intercomparison for NEEM, Northern Greenland (Atmospheric Chemistry and Physics (2012) 12 (4259–4277)), Atmos. Chem. Phys., 14, 3571–3572, https://doi.org/10.5194/acp-14-3571-2014, 2014. Burn-Nunes, L. J., Vallelonga, P., Loss, R. D., Burton, G. R., Moy, A., Curran, M., Hong, S., Smith, A. M., Edwards, R., Morgan, V. I., and Rosman, K. J. R.: Seasonal variability in the input of lead, barium and indium to Law Dome, Antarctica, Geochim. Cosmochim. Ac., 75, 1–20, https://doi.org/10.1016/j.gca.2010.09.037, 2011. Burr, A., Ballot, C., Lhuissier, P., Martinerie, P., Martin, C. L., and Philip, A.: Pore morphology of polar firn around closure revealed by X-ray tomography, The Cryosphere, 12, 2481–2500, https://doi.org/10.5194/tc-12-2481-2018, 2018. Chappellaz, J., Blunier, T., Kints, S., Dällenbach, A., Barnola, J.-M., Schwander, J., Raynaud, D., and Stauffer, B.: Changes in the atmospheric CH4 gradient between Greenland and Antarctica during the Holocene, J. Geophys. Res., 102, 15987–15997, 1997. Cook, E. R., Seager, R., Heim Jr., R. R., Vose, R. S., Herweijer, C., and Woodhouse, C.: Megadroughts in North America: placing IPCC projections of hydroclimatic change in a long-term palaeoclimate context, J. Quaternary Sci., 25, 48–61, 2009. Cook, E. R., Anchukaitis, K. J., Buckley, B. M., D'Arrigo, R. D., Jacoby, G. C., and Wright, W. E.: Asian monsson failure ans megadrought during the last Millenium, Science, 328, 486–489, https://doi.org/10.1126/science.1185188, 2010. Cook, E. R., Seager, R., Kushnir, Y., Briffa, K. R., Frank, D., Krusic, P. J., Tegel, W., Schrier, G. Van Der, Baillie, M., Baittinger, C., Bleicher, N., Bonde, N., Carrer, M., Cooper, R., Katarina, Č., and Dittmar, C.: Old World Megadroughts and Pluvials During the Common Era, Sci. Adv., 1, 1–9, 2015. Cox, P. and Jones, C.: Illuminating the Modern Dance of Climate and CO2, Science, 321, 1642–1644, 2008. Degroot, D.: Climate change and society in the 15th to 18th centuries, Wiley Interdiscip. Rev. Clim. Change, 2017, e518, https://doi.org/10.1002/wcc.518, 2018. Etheridge, D. M., Steele, L. P., Langenfeld, R. L., Francey, R. J., Barnola, J. M., and Morgan, V. I.: Natural and anthropogenic changes in atmospheric CO2 over the last 1000 years from air in Antarctic ice and firn, J. Geophys. Res., 101, 4115–4128, 1996. Etheridge, D. M., Steele, L. P., Francey, R. J., and Lagenfelds, R. L.: Atmospheric methane between 1000 A.D. and present: Evidence of anthropogenic emissions and climatic variability, J. Geophys. Res., 103, 15979–15993, 1998. Ferretti, D. F., Miller, J. B., White, J. W. C., Etheridge, D. M., Lassey, K. R., Lowe, D. C., MacFarling Meure, C. M., Dreier, M. F., Trudinger, C. M., van Ommen, T. D. and Langenfelds, R. L.: Unexpected changes to the global methane budget over the past 2000 years, Science, 309, 1714–1717, https://doi.org/10.1126/science.1115193, 2005. Flückiger, J., Dällenbach, A., Blunier, T., Stauffer, B., Stocker, T. F., Raynaud, D., and Barnola, J. M.: Variations in atmospheric N2O concentration during abrupt climatic changes, Science, 285, 227–230, https://doi.org/10.1126/science.285.5425.227, 1999. 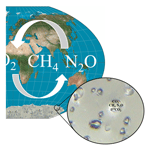 Flückiger, J., Monnin, E., Stauffer, B., Schwander, J., and Stocker, T. F.: High-resolution Holocene N2O ice core record and its relationship with CH4 and CO2, Global Biogeochem. Cy., 16, 1010, https://doi.org/10.1029/2001GB001417, 2002. Fourteau, K., Faïn, X., Martinerie, P., Landais, A., Ekaykin, A. A., Lipenkov, V. Y. and Chappellaz, J.: Analytical constraints on layered gas trapping and smoothing of atmospheric variability in ice under low-accumulation conditions, Clim. Past, 13, 1815–1830, https://doi.org/10.5194/cp-13-1815-2017, 2017. Francey, R. J. and Frederiksen, J. S.: The 2009–2010 step in atmospheric CO2 interhemispheric difference, Biogeosciences, 13, 873–885, https://doi.org/10.5194/bg-13-873-2016, 2016. 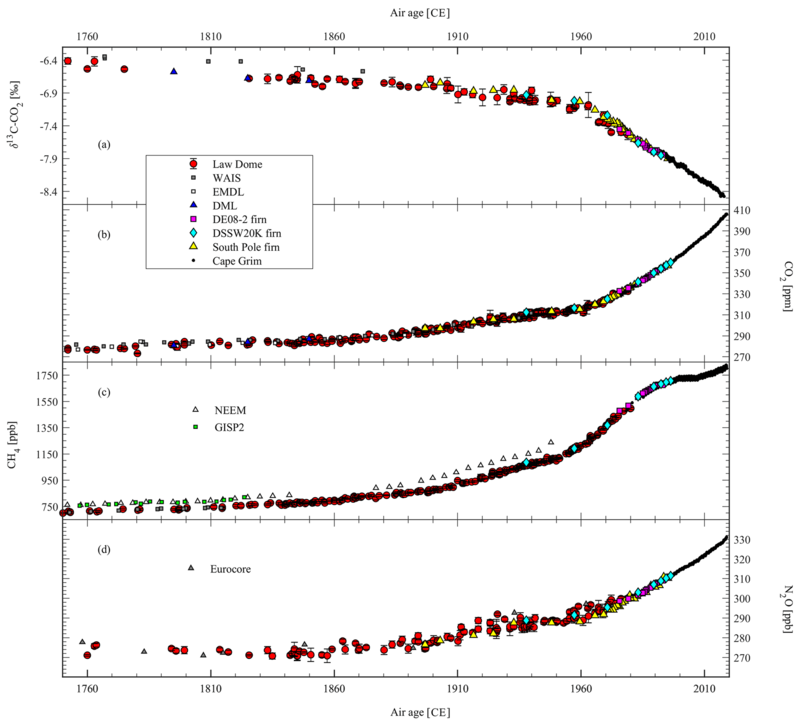 Francey, R. J., Allison, C. E., Etheridge, D. M., Trudinger, C. M., Enting, I. G., Leuenberger, M., Langenfeld, R. L., Michel, E., and Steele, L. P.: A 1000-year high precision record of δ13C in atmospheric CO2, Tellus B, 51, 170–193, 1999. Francey, R. J., Steele, L. P., Spencer, D. A., Langenfelds, R. L., Law, R. M., Krummel, P. B., Fraser, P. J., Etheridge, D. M., Derek, N., Coram, S. A., Cooper, L. N., Allison, C. E., Porter, L., and Baly, S.: The CSIRO (Australia) measurement of greenhouse gases in the global atmosphere, in: Baseline Atmospheric Program Australia, edited by: Tindale, N. W., Derek, N., and Fraser, P. J., Bureau of Meteorology and CSIRO Atmospheric Research, Melbourne, 42–53, 2003. Frederiksen, J. S. and Francey, R. J.: Unprecedented strength of Hadley circulation in 2015–2016 impacts on CO2 interhemispheric difference, Atmos. Chem. Phys., 18, 14837–14850, https://doi.org/10.5194/acp-18-14837-2018, 2018. Friedlingstein, P., Meinshausen, M., Arora, V. K., Jones, C. D., Anav, A., Liddicoat, S. K., and Knutti, R.: Uncertainties in CMIP5 climate projections due to carbon cycle feedbacks, J. Climate, 27, 511–526, https://doi.org/10.1175/JCLI-D-12-00579.1, 2014. Ghosh, A., Patra, P. K., Ishijima, K., Umezawa, T., Ito, A., Etheridge, D. M., Sugawara, S., Kawamura, K., Miller, J. B., Dlugokencky, E. J., Krummel, P. B., Fraser, P. J., Steele, L. P., Langenfelds, R. L., Trudinger, C. M., White, J. W. C., Vaughn, B., Saeki, T., Aoki, S., and Nakazawa, T.: Variations in global methane sources and sinks during 1910–2010, Atmos. Chem. Phys., 15, 2595–2612, https://doi.org/10.5194/acp-15-2595-2015, 2015. Goodwin, I. D.: Snow accumulation and surface topography in the katabatic zone of Eastern Wilkes Land, Antarctica, Antarct. Sci., 2, 235–242, https://doi.org/10.1017/S0954102090000323, 1990. Graven, H., Allison, C. E., Etheridge, D. M., Hammer, S., Keeling, R. F., Levin, I., Meijer, H. A. J., Rubino, M., Tans, P. P., Trudinger, C. M., Vaughn, B. H., and White, J. W. C.: Compiled records of carbon isotopes in atmospheric CO2 for historical simulations in CMIP6, Geosci. Model Dev., 10, 4405–4417, https://doi.org/10.5194/gmd-10-4405-2017, 2017. Gregory, S. A., Albert, M. R., and Baker, I.: Impact of physical properties and accumulation rate on pore close-off in layered firn, The Cryosphere, 8, 91–105, https://doi.org/10.5194/tc-8-91-2014, 2014. Grieman, M. M., Aydin, M., Fritzsche, D., McConnell, J. R., Opel, T., Sigl, M., and Saltzman, E. S.: Aromatic acids in a Eurasian Arctic ice core: A 2600-year proxy record of biomass burning, Clim. Past, 13, 395–410, https://doi.org/10.5194/cp-13-395-2017, 2017. Higgins, J. A., Kurbatov, A. V., Spaulding, N. E., Brook, E., Introne, D. S., Chimiak, L. M., Yan, Y., Mayewski, P. A., and Bender, M. L.: Atmospheric composition 1 million years ago from blue ice in the Allan Hills, Antarctica, P. Natl. Acad. Sci. USA, 112, 6887–6891, https://doi.org/10.1073/pnas.1420232112, 2015. Jenk, M. T., Rubino, M., Etheridge, D. E., Bigler, M., and Blunier, T.: Sources of excess CO2 in Greenland ice cores, in: AGU Fall Meeting, American Gephysical Union, San Francisco, 2012. Joos, F. and Bruno, M.: Long-term variability of the terrestrial and oceanic carbon sinks and the budgets of the carbon isotopes 13C and 14C, Global Biogeochem. Cy., 12, 277–295, 1998. Joos, F., Meyer, R., Bruno, M., and Leunenberger, M.: The variability in the C sinks as reconstructed for the last 1000 years, Geophys. Res. Lett., 26, 1437–1440, 1999. Koch, A., Brierley, C., Maslin, M. M., and Lewis, S. L.: Earth system impacts of the European arrival and Great Dying in the Americas after 1492, Quaternary Sci. Rev., 207, 13–36, https://doi.org/10.1016/j.quascirev.2018.12.004, 2019. Köhler, P., Nehrbass-Ahles, C., Schmitt, J., Stocker, T. F., and Fischer, H.: Comment on “Changes in atmospheric CO2 levels recorded by the isotopic signature of n-alkanes from plants” from K. S. Machado and S. Froehner, Global Planet. Change, 156, 24–25, https://doi.org/10.1016/j.gloplacha.2017.08.003, 2017a. Köhler, P., Nehrbass-Ahles, C., Schmitt, J., Stocker, T. F., and Fischer, H.: A 156 kyr smoothed history of the atmosphericgreenhouse gases CO2, CH4, and N2O and their radiativeforcing, Earth Syst. Sci. Data, 9, 363–387, https://doi.org/10.5194/essd-9-363-2017, 2017b. Krakauer, N. Y., Randerson, J. T., Primeau, F. W., Gruber, N., and Menemenlis, D.: Carbon isotope evidence for the latitudinal distribution and wind speed dependence of the air-sea gas transfer velocity, Tellus B, 58, 390–417, https://doi.org/10.1111/j.1600-0889.2006.00223.x, 2006. Lassey, K. R., Lowe, D. C., and Manning, M. R.: The trend in atmospheric methane δ13C and implications for isotopic constraints on the global methane budget, Global Biogeochem. Cy., 14, 41–49, 2000. Lassey, K. R., Etheridge, D. M., Lowe, D. C., Smith, A. M., and Ferretti, D. F.: Centennial evolution of the atmospheric methane budget: What do the carbon isotopes tell us?, Atmos. Chem. Phys., 7, 2119–2139, https://doi.org/10.5194/acp-7-2119-2007, 2007a. Lassey, K. R., Lowe, D. C., and Smith, A. M.: The atmospheric cycling of radiomethane and the “fossil fraction” of the methane source, Atmos. Chem. Phys., 7, 2141–2149, https://doi.org/10.5194/acp-7-2141-2007, 2007b. Lewis, S. L. and Maslin, M. A.: Defining the Anthropocene, Nature, 519, 171–180, https://doi.org/10.1038/nature14258, 2015. MacFarling Meure, C., Etheridge, D., Trudinger, C., Steele, P., Langenfelds, R., van Ommen, T., Smith, A., and Elkins, J.: Law Dome CO2, CH4 and N2O ice core records extended to 2000 years BP, Geophys. Res. Lett., 33, L14810, https://doi.org/10.1029/2006GL026152, 2006. Machado, K. S. and Froehner, S.: Changes in atmospheric CO2 levels recorded by the isotopic signature of n-alkanes from plants, Global Planet. Change, 148, 72–78, https://doi.org/10.1016/j.gloplacha.2016.11.015, 2017. Machida, T., Nakazawa, T., Fujii, Y., Aoki, S., and Watanabe, O.: Increase in the atmospheric nitrous oxide concentration during the last 250 years, Geophys. Res. Lett., 22, 2921–2924, 1995. Mann, M. E., Zhang, Z., Hughes, M. K., Bradley, R. S., Miller, S. K., Rutherford, S. and Ni, F.: Proxy-based reconstructions of hemispheric and global surface temperature variations over the past two millennia, P. Natl. Acad. Sci. USA, 105, 13252–13257, https://doi.org/10.1073/pnas.0805721105, 2008. Mann, M. E., Zhang, Z., Rutherford, S., Bradley, R. S., Hughes, M. K., Shindell, D., Ammann, C., Faluvegi, G., and Ni, F.: Global signatures and dynamical origins of the little ice age and medieval climate anomaly, Science, 326, 1256–1260, https://doi.org/10.1126/science.1177303, 2009. Marcott, S. A., Bauska, T. K., Buizert, C., Steig, E. J., Rosen, J. L., Cuffey, K. M., Fudge, T. J., Severinghaus, J. P., Ahn, J., Kalk, M. L., McConnell, J. R., Sowers, T., Taylor, K. C., White, J. W. C., and Brook, E. J.: Centennial-scale changes in the global carbon cycle during the last deglaciation, Nature, 514, 616–619, https://doi.org/10.1038/nature13799, 2014. Marlon, J. R., Bartlein, P. J., Daniau, A. L., Harrison, S. P., Maezumi, S. Y., Power, M. J., Tinner, W., and Vanniére, B.: Global biomass burning: A synthesis and review of Holocene paleofire records and their controls, Quaternary Sci. Rev., 65, 5–25, https://doi.org/10.1016/j.quascirev.2012.11.029, 2013. Marlon, J. R., Kelly, R., Daniau, A. L., Vannière, B., Power, M. J., Bartlein, P., Higuera, P., Blarquez, O., Brewer, S., Brücher, T., Feurdean, A., Romera, G. G., Iglesias, V., Yoshi Maezumi, S., Magi, B., Mustaphi, C. J. C., and Zhihai, T.: Reconstructions of biomass burning from sediment-charcoal records to improve data-model comparisons, Biogeosciences, 13, 3225–3244, https://doi.org/10.5194/bg-13-3225-2016, 2016. Mischler, J. A., Sowers, T. A., Alley, R. B., Battle, M., McConnell, J. R., Mitchell, L., Popp, T., Sofen, E., and Spencer, M. K.: Carbon and hydrogen isotopic composition of methane over the last 1000 years, Global Biogeochem. Cy., 23, 1–13, https://doi.org/10.1029/2009GB003460, 2009. Mitchell, L. E., Brook, E. J., Sowers, T., McConnell, J. R., and Taylor, K.: Multidecadal variability of atmospheric methane, 1000–1800 C.E., J. Geophys. Res.-Biogeo., 116, 1–16, https://doi.org/10.1029/2010JG001441, 2011. Mitchell, L. E., Brook, E., Lee, J. E., Buizert, C., and Sowers, T.: Constraints on the Late Holocene Atmospheric Methane Budget, Science, 342, 964–967, https://doi.org/10.1126/science.1238920, 2013. Mitchell, L. E., Buizert, C., Brook, E. J., Breton, D. J., Fegyveresi, J., Baggenstos, D., Orsi, A., Severinghaus, J., Alley, R. B., Albert, M., Rhodes, R. H., McConnell, J. R., Sigl, M., Maselli, O., Gregory, S., and Ahn, J.: Observing and modeling the influence of layering on bubble trapping in polar firn, J. Geophys. Res., 120, 2558–2574, https://doi.org/10.1002/2014JD022766, 2015. Monnin, E., Indermühle, A., Dällenbach, A., Flückiger, J., Stauffer, B., Stocker, T. F., Raynaud, D., and Barnola, J. M.: Atmospheric CO2 Concentrations over the Last Glacial Termination, Science, 291, 112–114, 2001. Monnin, E., Steig, E. J., Siegenthaler, U., Kawamura, K., Schwander, J., Stauffer, B., Stocker, T. F., Morse, D. L., Barnola, J. M., Bellier, B., Raynaud, D., and Fischer, H.: Evidence for substantial accumulation rate variability in Antarctica during the Holocene, through synchronization of CO2 in the Taylor Dome, Dome C and DML ice cores, Earth Planet. Sc. Lett., 224, 45–54, 2004. Neukom, R., Gergis, J., Karoly, D. J., Wanner, H., Curran, M., Elbert, J., González-Rouco, F., Linsley, B. K., Moy, A. D., Mundo, I., Raible, C. C., Steig, E. J., van Ommen, T., Vance, T., Villalba, R., Zinke, J., and Frank, D.: Inter-hemispheric temperature variability over the past millennium, Nat. Clim. Change, 4, 362–367, https://doi.org/10.1038/nclimate2174, 2014. Pages2k: Continental-scale temperature variability during the past two millennia, Nat. Geosci., 6, 339–346, https://doi.org/10.1038/ngeo1797, 2013. Park, S., Croteau, P., Boering, K. A., Etheridge, D. M., Ferretti, D., Fraser, P. J., Kim, K. R., Krummel, P. B., Langenfelds, R. L., Van Ommen, T. D., Steele, L. P., and Trudinger, C. M.: Trends and seasonal cycles in the isotopic composition of nitrous oxide since 1940, Nat. Geosci., 5, 261–265, https://doi.org/10.1038/ngeo1421, 2012. Pedro, J. 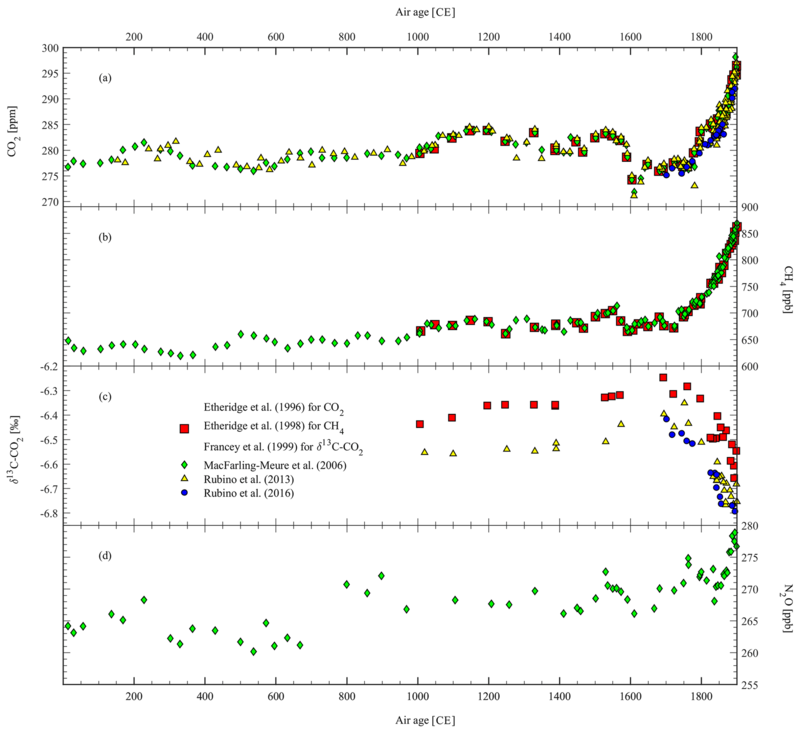 B., Smith, A. M., Simon, K. J., Van Ommen, T. D., and Curran, M. A. J.: High-resolution records of the beryllium-10 solar activity proxy in ice from Law Dome, East Antarctica: Measurement, reproducibility and principal trends, Clim. Past, 7, 707–721, https://doi.org/10.5194/cp-7-707-2011, 2011. Petrenko, V. V., Smith, A. M., Brook, E. J., Lowe, D., Riedel, K., Brailsford, G., Hua, Q., Schaefer, H., Reeh, N., Weiss, R. F., Etheridge, D., and Severinghaus, J. P.: 14CH4 measurements in Greenland Ice: Investigating last glacial termination CH4 sources, Science, 324, 506–508, https://doi.org/10.1126/science.1168909, 2009. Petrenko, V. V., Smith, A. M., Schaefer, H., Riedel, K., Brook, E., Baggenstos, D., Harth, C., Hua, Q., Buizert, C., Schilt, A., Fain, X., Mitchell, L., Bauska, T., Orsi, A., Weiss, R. F., and Severinghaus, J. P.: Minimal geological methane emissions during the Younger Dryas-Preboreal abrupt warming event, Nature, 548, 443–446, https://doi.org/10.1038/nature23316, 2017. Plummer, C. T., Curran, M. A. J., Van Ommen, T. D., Rasmussen, S. O., Moy, A. D., Vance, T. R., Clausen, H. B., Vinther, B. M., and Mayewski, P. A.: An independently dated 2000-yr volcanic record from Law Dome, East Antarctica, including a new perspective on the dating of the 1450s CE eruption of Kuwae, Vanuatu, Clim. Past, 8, 1929–1940, https://doi.org/10.5194/cp-8-1929-2012, 2012. Pongratz, J. and Caldeira, K.: Attribution of atmospheric CO2 and temperature increases to regions: Importance of preindustrial land use change, Environ. Res. Lett., 7, 034001, https://doi.org/10.1088/1748-9326/7/3/034001, 2012. Prokopiou, M., Martinerie, P., Sapart, C. J., Witrant, E., Monteil, G., Ishijima, K., Bernard, S., Kaiser, J., Levin, I., Blunier, T., Etheridge, D., Dlugokencky, E., Van De Wal, R. S. W., and Röckmann, T.: Constraining N2O emissions since 1940 using firn air isotope measurements in both hemispheres, Atmos. Chem. Phys., 17, 4539–4564, https://doi.org/10.5194/acp-17-4539-2017, 2017. Prokopiou, M., Sapart, C. J., Rosen, J., Sperlich, P., Blunier, T., Brook, E., van deWal, R. S. W., and Röckmann, T.: Changes in the isotopic signature of atmospheric nitrous oxide and its global average source during the last three millennia, J. Geophys. Res.-Atmos., 123, 10757–10773, https://doi.org/10.1029/2018JD02900, 2018. Randerson, J. T., Collatz, G. J., Fessenden, J. E., Munoz, A. D., Still, C. J., Berry, J. A., Fung, I. Y., Suits, N., and Denning, A. S.: A possible global covariance between terrestrial gross primary production and 13C discrimination: Consequences for the atmospheric 13C budget and its response to ENSO, Global Biogeochem. Cy., 16, 1136, https://doi.org/10.1029/2001GB001845, 2002. Rhodes, R. H., Faïn, X., Stowasser, C., Blunier, T., Chappellaz, J., McConnell, J. R., Romanini, D., Mitchell, L. E., and Brook, E. J.: Continuous methane measurements from a late Holocene Greenland ice core: Atmospheric and in-situ signals, Earth Planet. Sc. Lett., 368, 9–19, https://doi.org/10.1016/j.epsl.2013.02.034, 2013. Rubino, M., Etheridge, D. M., Trudinger, C. M., Allison, C. E., Battle, M. O., Langenfelds, R. L., Steele, L. P., Curran, M., Bender, M., White, J. W. C., Jenk, T. M., Blunier, T., and Francey, R. J.: A revised 1000 year atmospheric δ13C-CO2 record from Law Dome and South Pole, Antarctica, J. Geophys. Res.-Atmos., 118, 8482–8499, https://doi.org/10.1002/jgrd.50668, 2013. Rubino, M., Etheridge, D. M., Trudinger, C. M., Allison, C. E., Rayner, P. J., Enting, I., Mulvaney, R., Steele, L. P., Langenfelds, R. L., Sturges, W. T., Curran, M. A. J., and Smith, A. M.: Low atmospheric CO2 levels during the Little Ice Age due to cooling-induced terrestrial uptake, Nat. Geosci., 9, 691–694, https://doi.org/10.1038/ngeo2769, 2016. Rubino, M., Etheridge, D. M., Thornton, D. P., Howden, R., Allison, C. E., Francey, R. J., Langenfelds, R. L., Steele, P. L., Trudinger, C. M., Spencer, D. A., Curran, M. A. J., Van Ommen, T. D., and Smith, A. M.: Revised records of atmospheric trace gases CO2, CH4, N2O and δ13C-O2 over the last 2000 years from Law Dome, Antarctica, Earth Syst. Sci. Data Discuss., https://doi.org/10.5194/essd-2018-146, in review, 2018. Ryu, Y., Ahn, J., and Yang, J. W.: High-Precision Measurement of N2O Concentration in Ice Cores, Environ. Sci. Technol., 52, 731–738, https://doi.org/10.1021/acs.est.7b05250, 2018. Sapart, C. J., Monteil, G., Prokopiou, M., van de Wal, R. S. W., Kaplan, J. O., Sperlich, P., Krumhardt, K. M., van der Veen, C., Houweling, S., Krol, M. C., Blunier, T., Sowers, T., Martinerie, P., Witrant, E., Dahl-Jensen, D., and Röckmann, T.: Natural and anthropogenic variations in methane sources during the past two millennia, Nature, 490, 85–88, https://doi.org/10.1038/nature11461, 2012. Schaefer, H., Lourantou, A., Chappellaz, J., Lüthi, D., Bereiter, B., and Barnola, J. M.: On the suitability of partially clathrated ice for analysis of concentration and δ13C of palaeo-atmospheric CO2, Earth Planet. Sc. Lett., 307, 334–340, https://doi.org/10.1016/j.epsl.2011.05.007, 2011. Schilt, A., Baumgartner, M., Schwander, J., Buiron, D., Capron, E., Chappellaz, J., Loulergue, L., Schüpbach, S., Spahni, R., Fischer, H., and Stocker, T. F.: Atmospheric nitrous oxide during the last 140,000 years, Earth Planet. Sc. Lett., 300, 33–43, https://doi.org/10.1016/j.epsl.2010.09.027, 2010. Schilt, A., Brook, E. J., Bauska, T. K., Baggenstos, D., Fischer, H., Joos, F., Petrenko, V. V., Schaefer, H., Schmitt, J., Severinghaus, J. P., Spahni, R., and Stocker, T. F.: Isotopic constraints on marine and terrestrial N2O emissions during the last deglaciation, Nature, 516, 234–237, https://doi.org/10.1038/nature13971, 2014. Schmidt, G. A., Annan, J. D., Bartlein, P. J., Cook, B. I., Guilyardi, E., Hargreaves, J. C., Harrison, S. P., Kageyama, M., Legrande, A. N., Konecky, B., Lovejoy, S., Mann, M. E., Masson-Delmotte, V., Risi, C., Thompson, D., Timmermann, A., and Yiou, P.: Using palaeo-climate comparisons to constrain future projections in CMIP5, Clim. Past, 10, 221–250, https://doi.org/10.5194/cp-10-221-2014, 2014. Schmitt, J., Schneider, R., Elsig, J., Leuenberger, D., Lourantou, A., Joos, F., Leuenberger, M., and Fischer, H.: Carbon Isotope Constraints on the Deglacial CO2 Rise from Ice Cores, Science, 2, 1–4, 2012. Scholze, M., Kaplan, J. O., Knorr, W., and Heimann, M.: Climate and interannual variability of the atmosphere-biosphere 13CO2 flux, Geophys. Res. Lett., 30, 1097, https://doi.org/10.1029/2002GL015631, 2003. Schwander, J., Barnola, J.-M., Andrie, C., Leuenberger, M., Ludin, A., Raynaud, D., and Stauffer, B.: The age of air in the firn and ice at Summit, Greenland, J. Geophys. Res., 98, 2831–2838, 1993. Siegenthaler, U., Monnin, E., Kawamura, K., Spahni, R., Schwander, J., Stauffer, B., Stocker, T. F., Barnola, J. M., and Fischer, H.: Supporting evidence from the EPICA Dronning Maud Land ice core for atmospheric CO2 changes during the past millennium, Tellus B, 57, 51–57, 2005. Sigl, M., Winstrup, M., McConnell, J. R., Welten, K. C., Plunkett, G., Ludlow, F., Büntgen, U., Caffee, M., Chellman, N., Dahl-Jensen, D., Fischer, H., Kipfstuhl, S., Kostick, C., Maselli, O. J., Mekhaldi, F., Mulvaney, R., Muscheler, R., Pasteris, D. R., Pilcher, J. R., Salzer, M., Schüpbach, S., Steffensen, J. P., Vinther, B. M., and Woodruff, T. E.: Timing and climate forcing of volcanic eruptions for the past 2,500 years, Nature, 523, 543–549, https://doi.org/10.1038/nature14565, 2015. Smith, A. M., Fink, D., Child, D., Levchenko, V. A., Morgan, V. I., Curran, M., Etheridge, D. M., and Elliott, G.: 7Be and 10Be concentrations in recent firn and ice at Law Dome, Antarctica, Nucl. Instrum. Meth. Phys. Res. B, 172, 847–855, 2000. Stocker, B. D., Strassmann, K., and Joos, F.: Sensitivity of Holocene atmospheric CO2 and the modern carbon budget to early human land use: analyses with a process-based model, Biogeosciences, 8, 69–88, https://doi.org/10.5194/bg-8-69-2011, 2011. Stocker, T. F., Dahe, Q., Plattner, G.-K., Alexander, L. V., Allen, S. K., Bindoff, N. L., Bréon, F.-M., Church, J. A., Cubash, U., Emori, S., Forster, P., Friedlingstein, P., Talley, L. D., Vaughan, D. G., and Xie, S.-P.: Technical Summary, in: Climate Change 2013: The Physical Science Basis, Contribution of Working Group I to the Fifth Assessment Report of the Intergovernmental Panel on Climate Change, edited by: Stocker, T. F., Qin, D., Plattner, G.-K., Tignor, M., Allen, S. K., Boschung, J., Nauels, A., Xia, Y., Bex, V., and Midgley, P. M., Cambridge University Press, Cambridge, UK and New York, NY, USA, 2013. Sturrock, G. A., Etheridge, D. M., Trudinger, C. M., Fraser, P. J., and Smith, A. M.: Atmospheric histories of halocarbons from analysis of Antarctic firn air: Major Montreal Protocol species, J. Geophys. Res.-Atmos., 107, 1–14, https://doi.org/10.1029/2002JD002548, 2002. Thompson, L. G., Mosley-Thompson, E., Davis, M. E., Zagorodnov, V. S., Howat, I. M., Mikhalenko, V. N., and Lin, P. N.: Annually resolved ice core records of tropical climate variability over the past 1800 years, Science, 340, 945–950, https://doi.org/10.1126/science.1234210, 2013. Trudinger, C. M.: The carbon cycle over the last 1000 years inferred from inversion of ice core data, Monash University, available at: http://www.cmar.csiro.au/e-print/open/trudinger_2001a0.htm (last access: 4 April 2019), 2000. Trudinger, C. M., Enting, I. G., Etheridge, D. M., Francey, R. J., Levchenko, V. A., and Steele, L. P.: Modeling air movement and bubble trapping in firn, J. Gephys. Res.-Atmos., 102, 6747–6763, 1997. Trudinger, C. M., Enting, I. G., Francey, R. J., Etheridge, D. M., and Rayner, P. J.: Long-term variability in the global carbon cycle inferred from a high-precision CO2 and δ13C ice-core record, Tellus B, 51, 233–248, 1999. 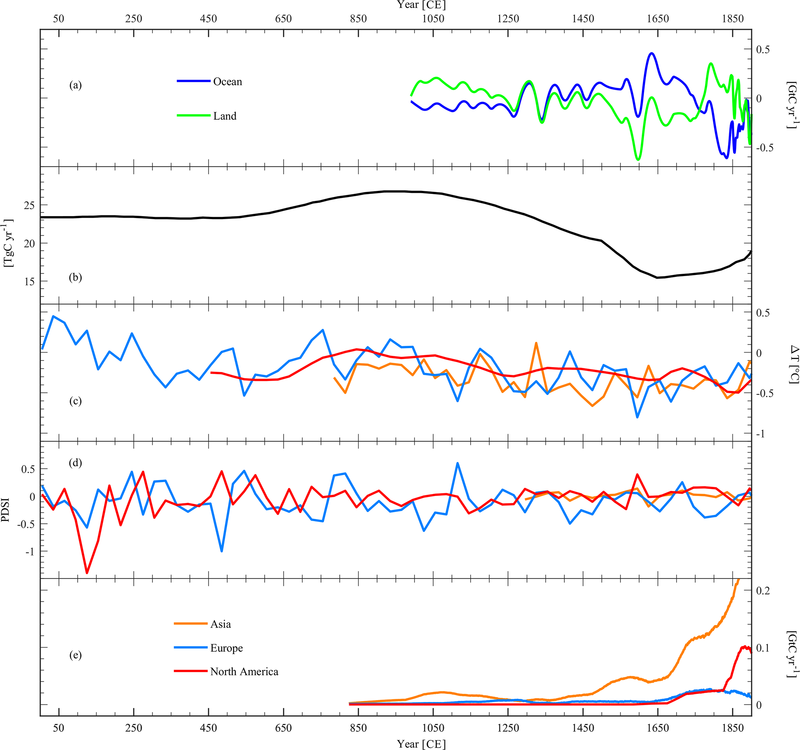 Trudinger, C. M. Enting, I. G. Rayner, P. J., and Francey, R. J.: Kalman filter analysis of ice core data 2. 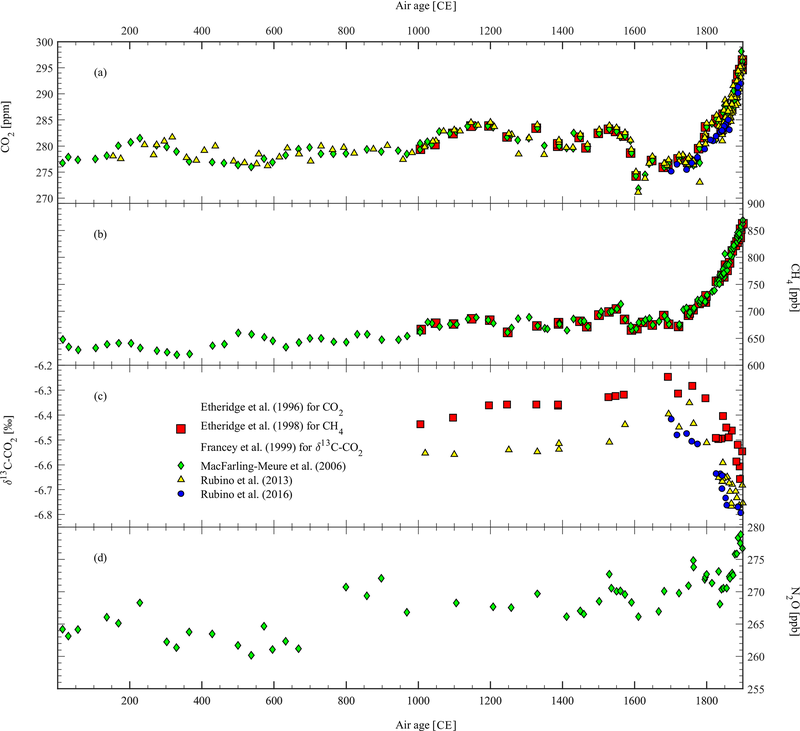 Double deconvolution of CO2 and δ13C measurements, J. Geophys. Res., 107, XLVII–XLVIII, https://doi.org/10.1029/2001JD001112, 2002a. Trudinger, C. M., Etheridge, D. M., Rayner, P. J., Enting, I. G., Sturrock, G. A., and Langenfelds, R. L.: Reconstructing atmospheric histories from measurements of air composition in firn, J. Geophys. Res.-Atmos., 107, 4780, https://doi.org/10.1029/2002JD002545, 2002b. Trudinger, C. M., Enting, I. G., Rayner, P. J., Etheridge, D. M., Buizert, C., Rubino, M., Krummel, P. B., and Blunier, T.: How well do different tracers constrain the firn diffusivity profile?, Atmos. Chem. Phys., 13, 1485–1510, https://doi.org/10.5194/acp-13-1485-2013, 2013. Tschumi, J. and Stauffer, B.: Reconstructing past atmospheric CO2 concentrations based on ice-core analyses: open questions due to in situ production of CO2 in the ice, J. Glaciol., 46, 45–53, 2000.
van Ommen, T. D., Morgan, V. I., and Curran, M. A. J.: Deglacial and Holocene changes in accumulation at Law Dome, Ann. Glaciol., 39, 359–365, 2005. Wang, Z., Chappellaz, J., Park, K., and Mak, J. E.: Large variations in southern hemisphere biomass burning during the last 650 years, Science, 330, 1663–1666, https://doi.org/10.1126/science.1197257, 2010. Wolff, E. W., Barbante, C., Becagli, S., Bigler, M., Boutron, C. F., Castellano, E., de Angelis, M., Federer, U., Fischer, H., Fundel, F., Hansson, M., Hutterli, M., Jonsell, U., Karlin, T., Kaufmann, P., Lambert, F., Littot, G. C., Mulvaney, R., Röthlisberger, R., Ruth, U., Severi, M., Siggaard-Andersen, M. L., Sime, L. C., Steffensen, J. P., Stocker, T. F., Traversi, R., Twarloh, B., Udisti, R., Wagenbach, D., and Wegner, A.: Changes in environment over the last 800,000 years from chemical analysis of the EPICA Dome C ice core, Quaternary Sci. Rev., 29, 285–295, 2010.